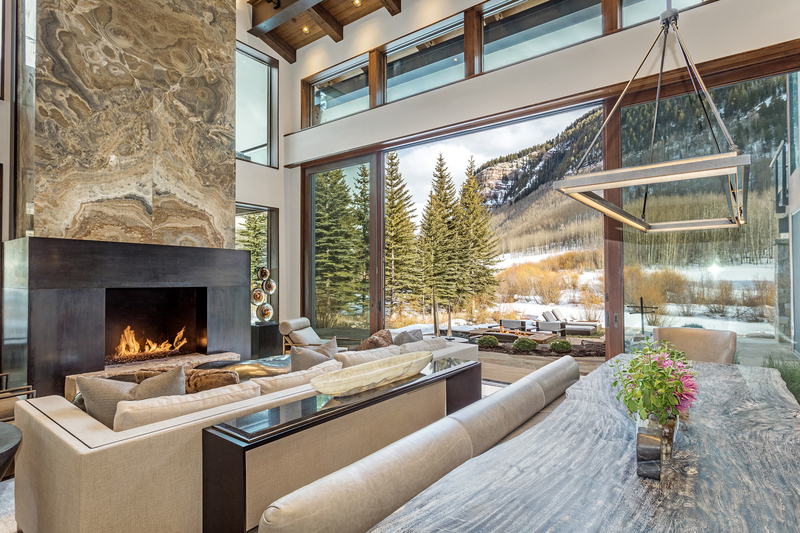 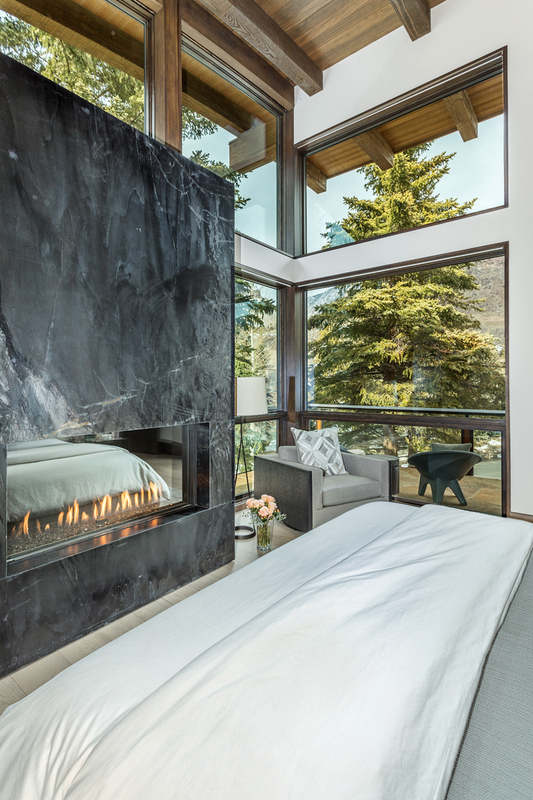 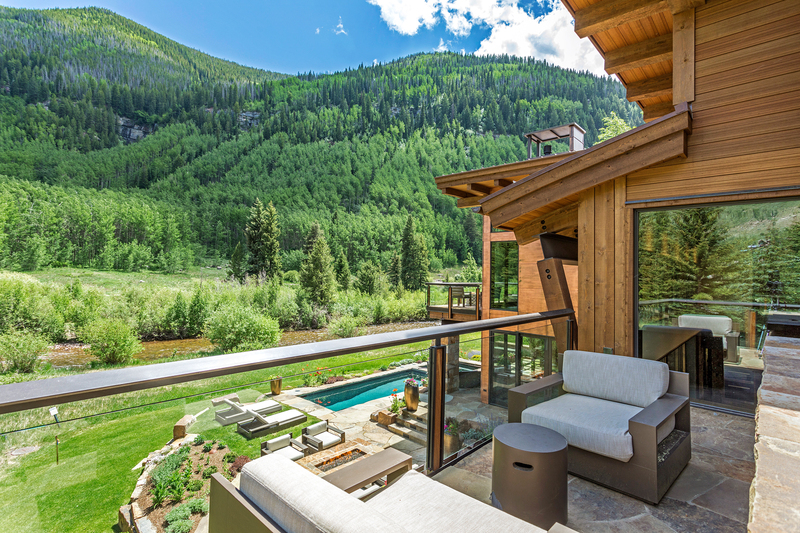 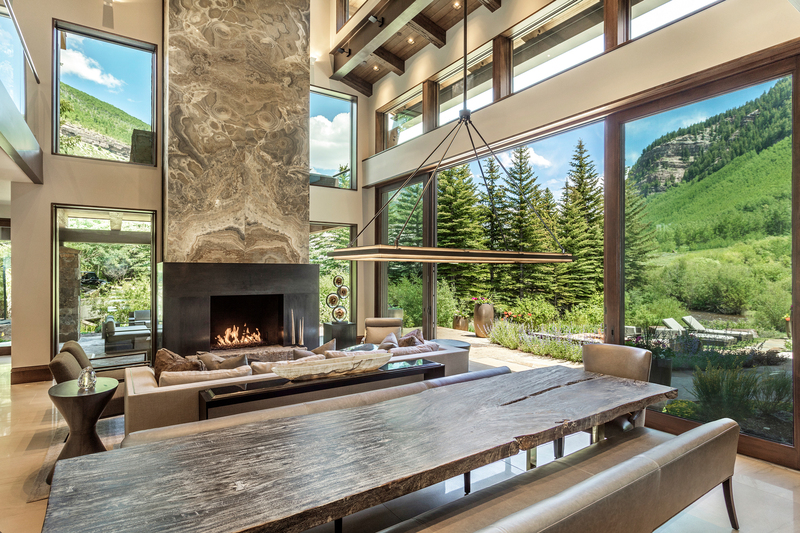 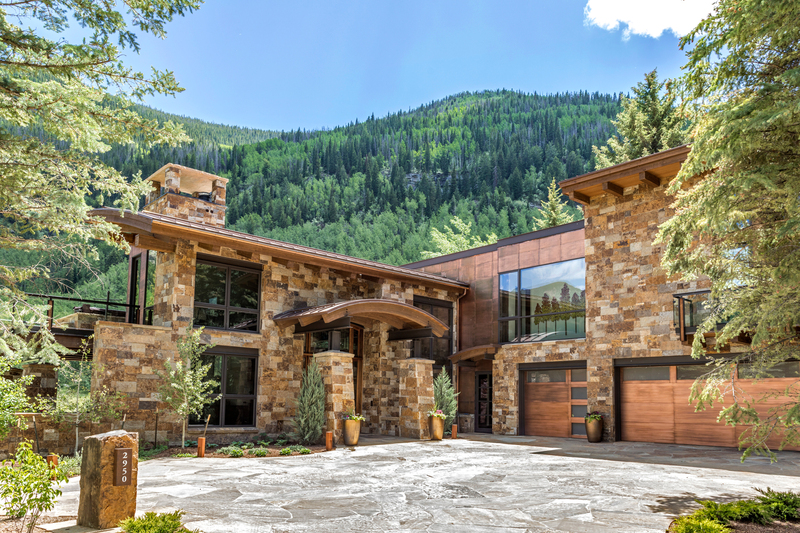 Completed in 2017, this ultimate, modern alpine home designed by Hans Berglund Architects offers unparalleled amenities with a canvas of Vail Mountain, Gore Creek and the Gore Range as the backdrop. 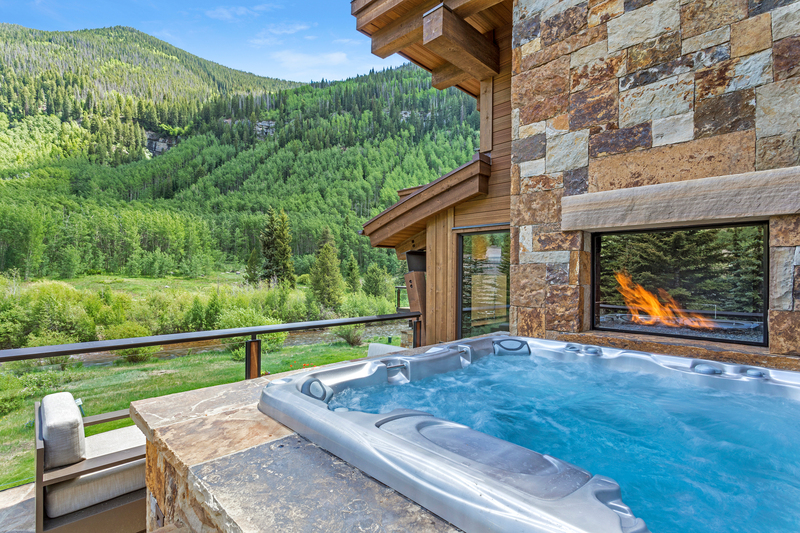 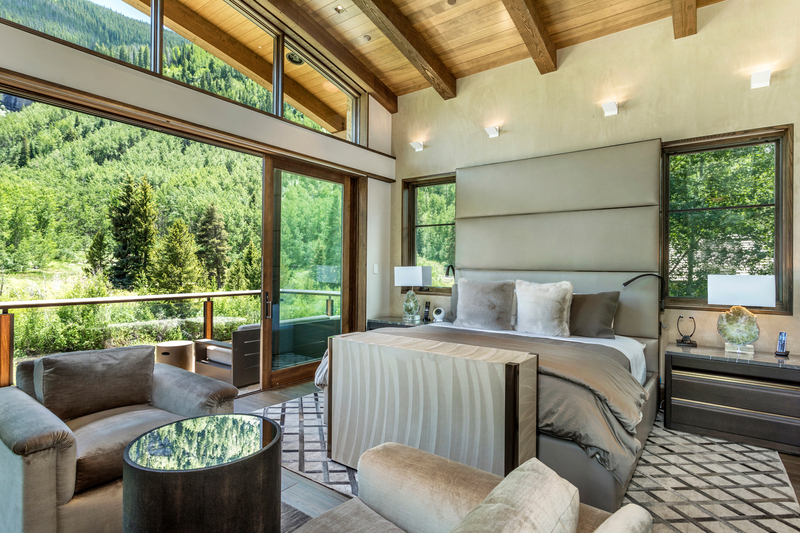 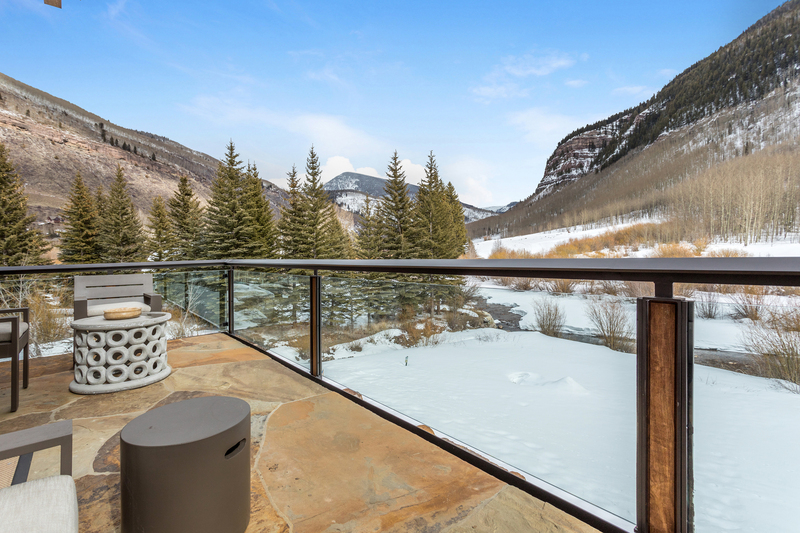 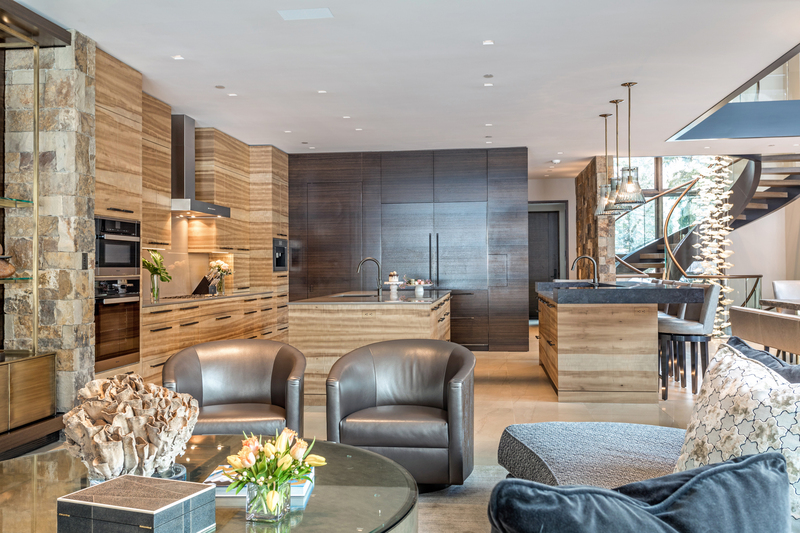 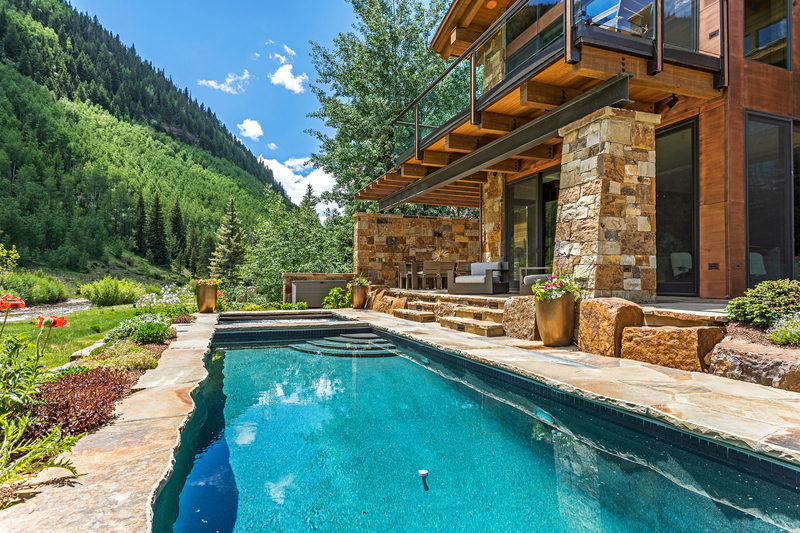 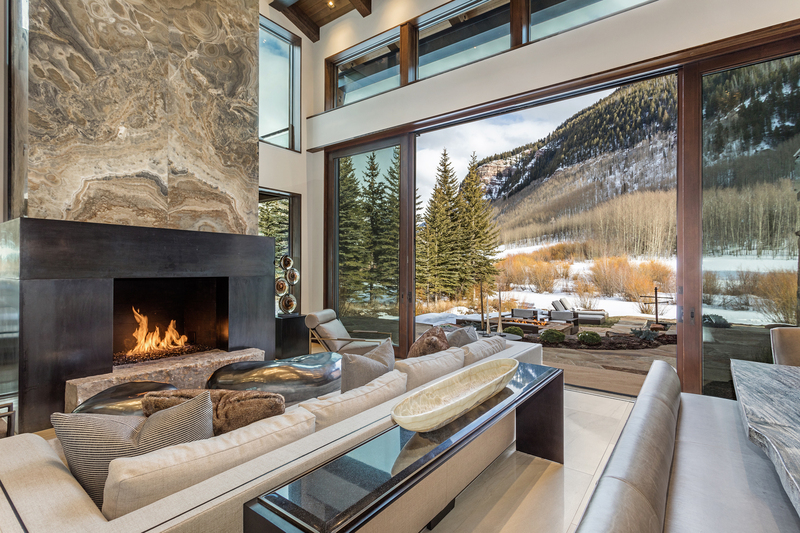 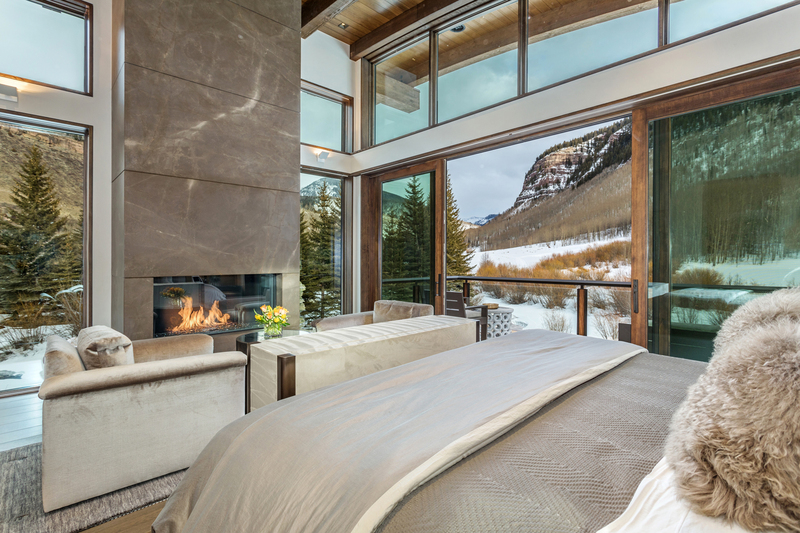 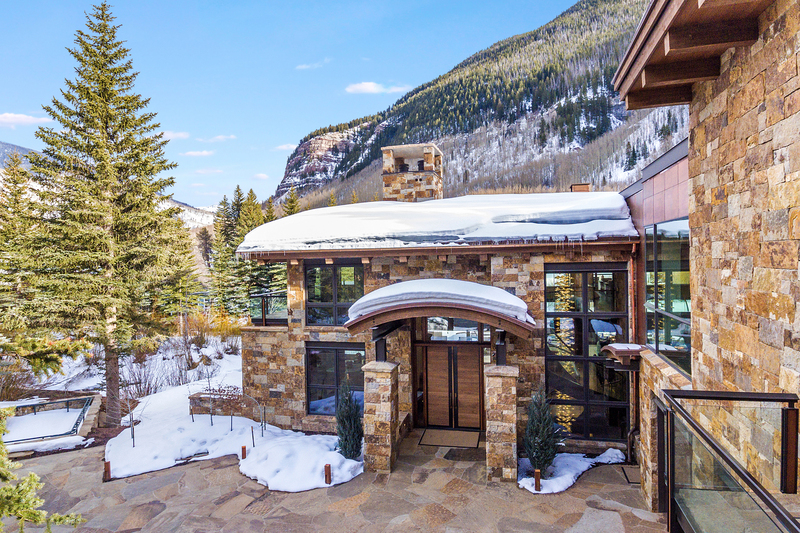 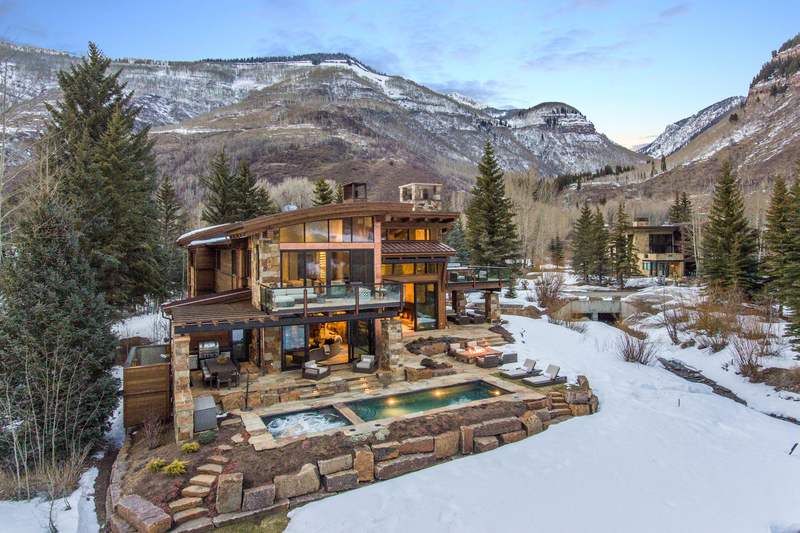 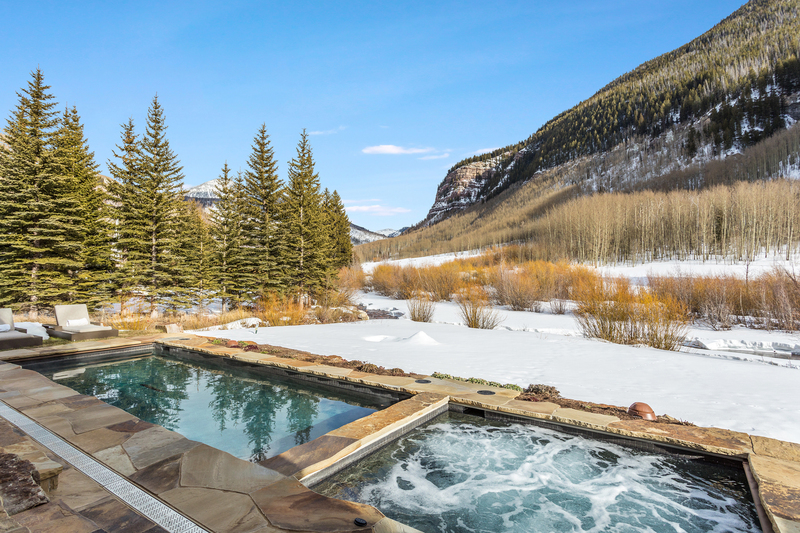 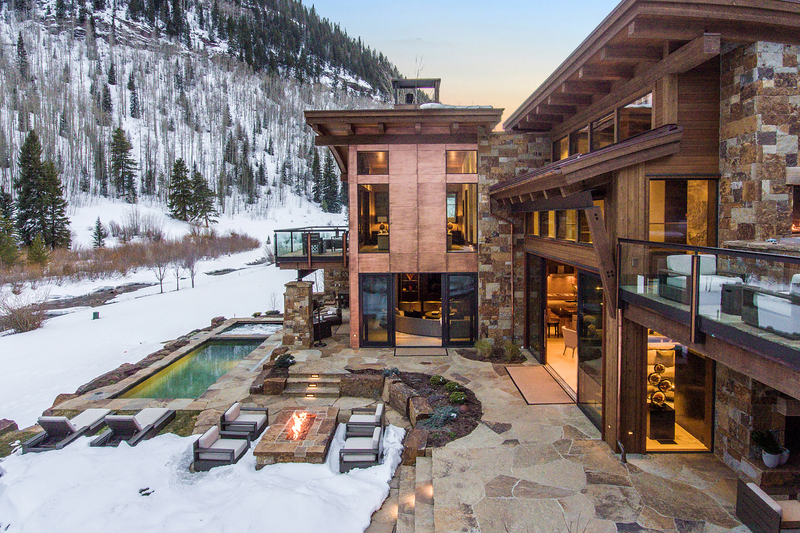 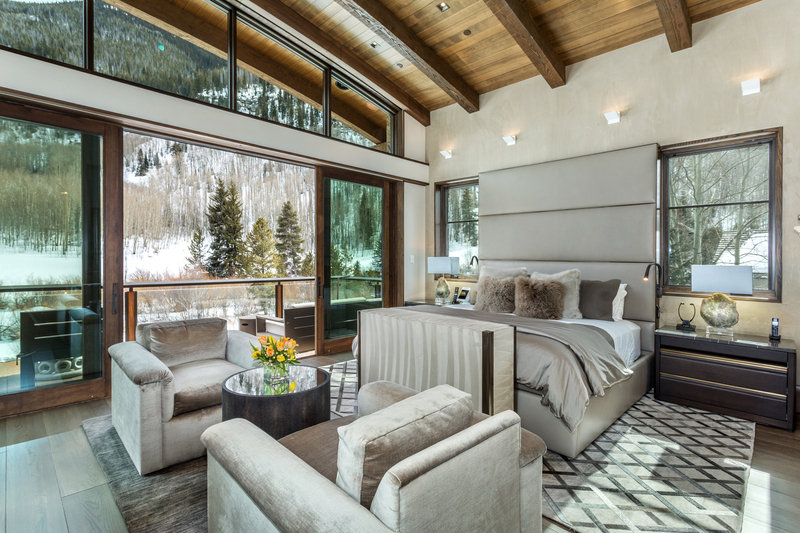 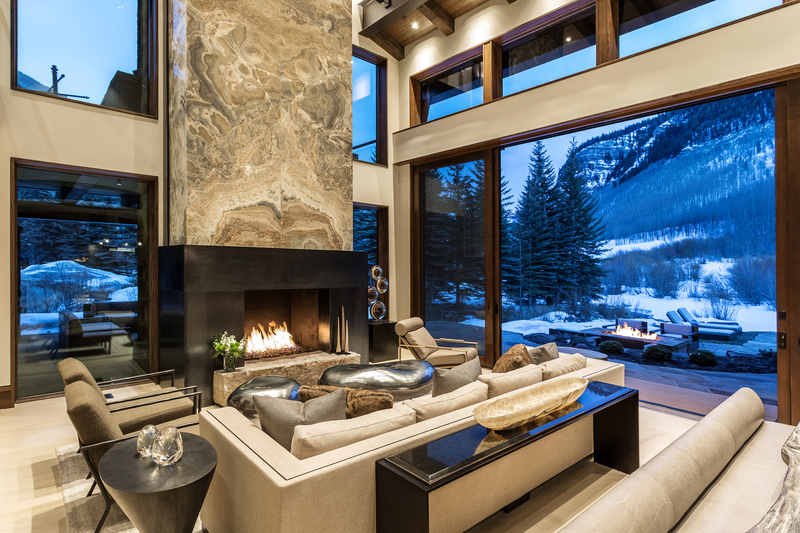 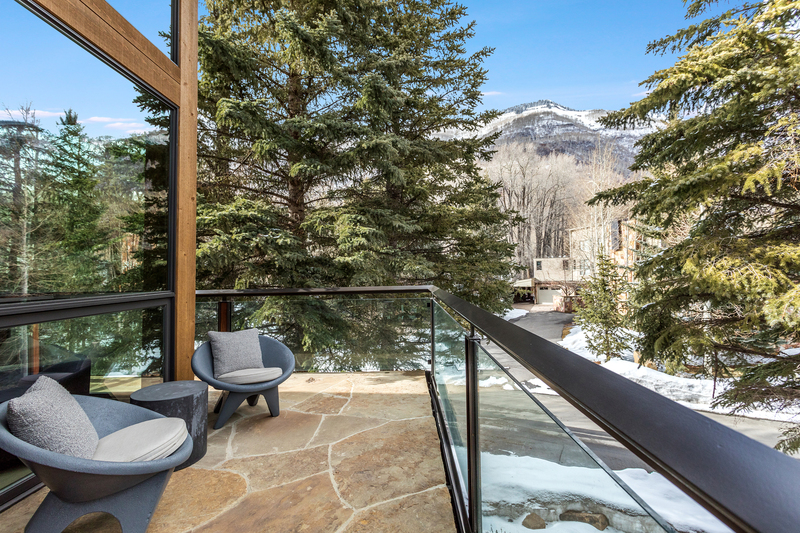 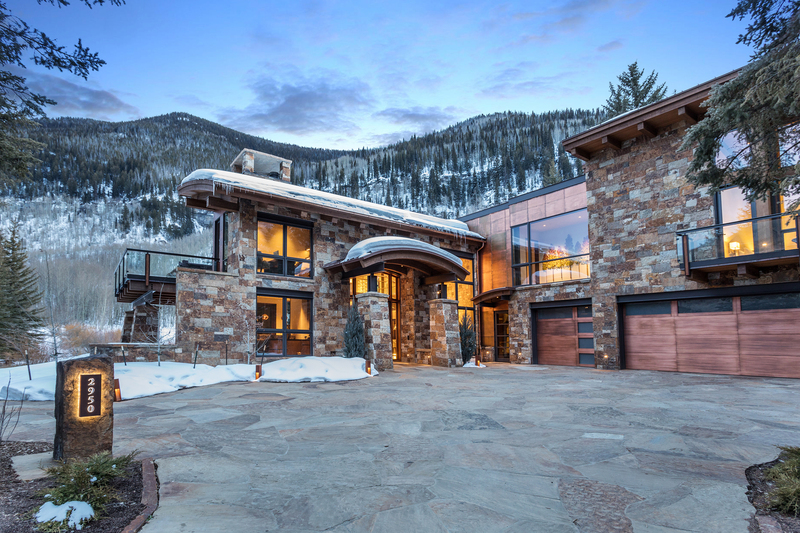 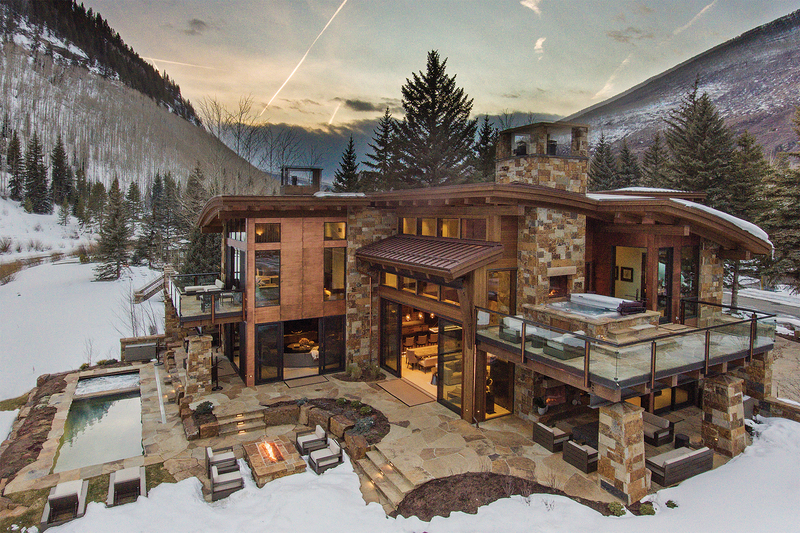 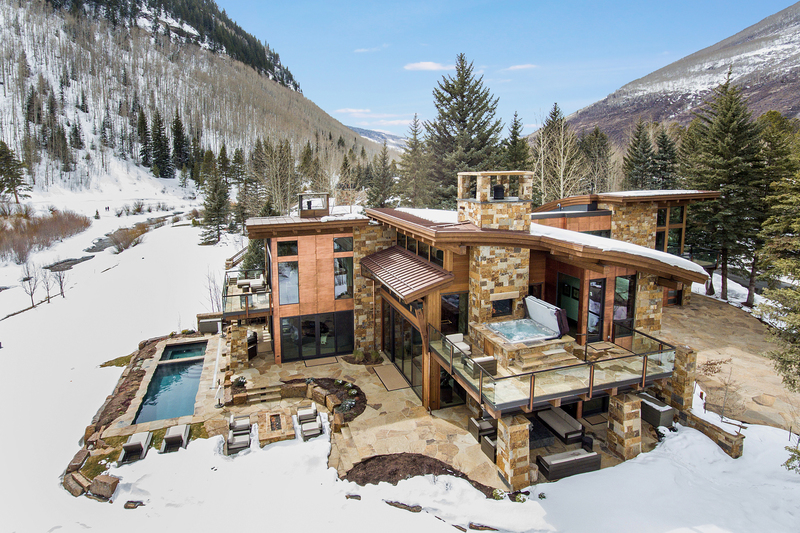 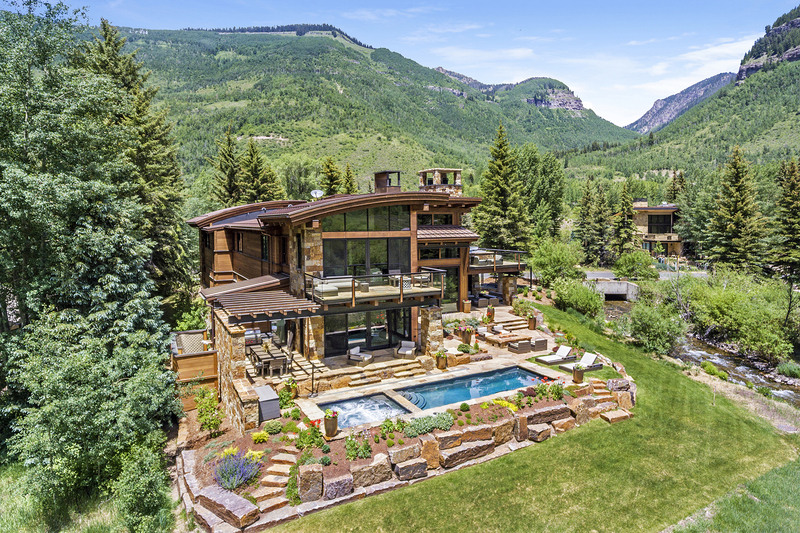 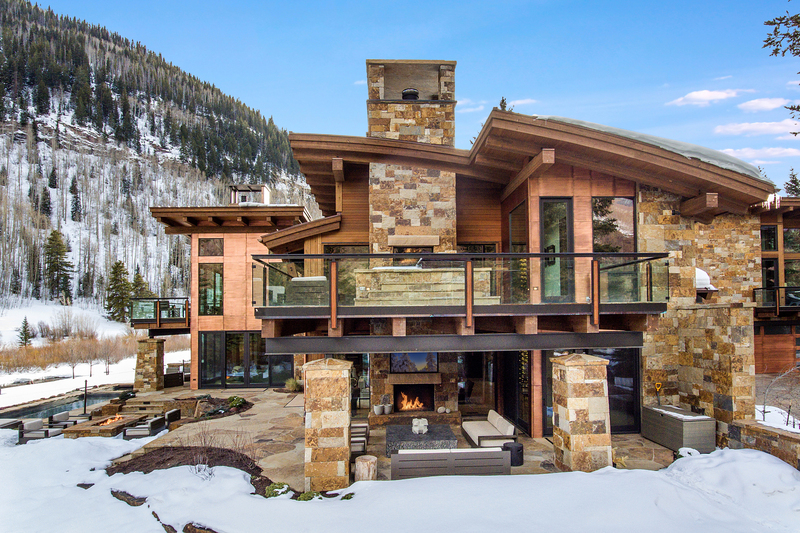 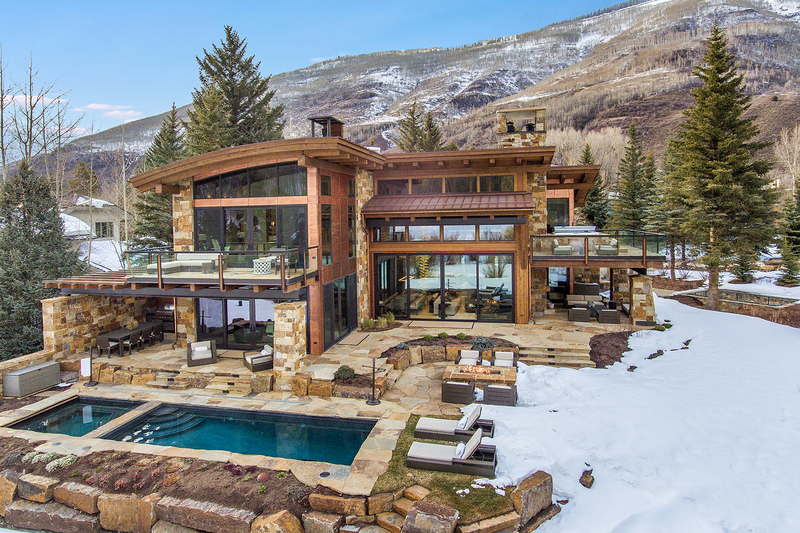 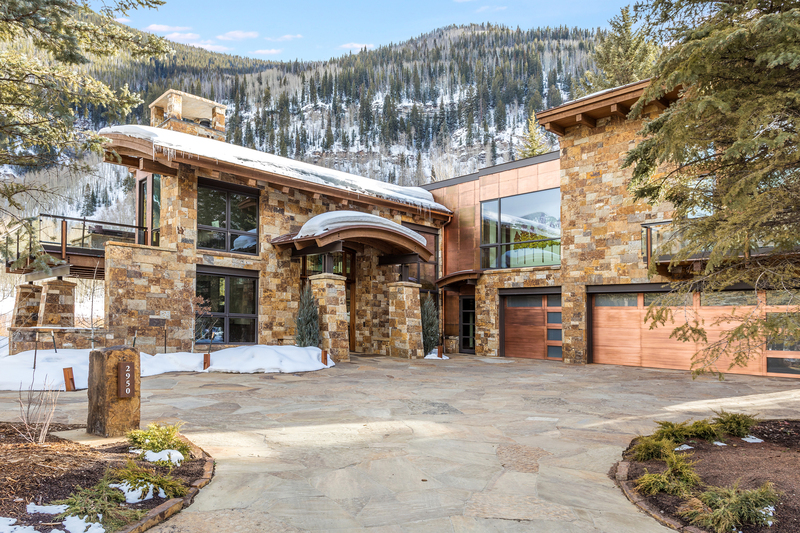 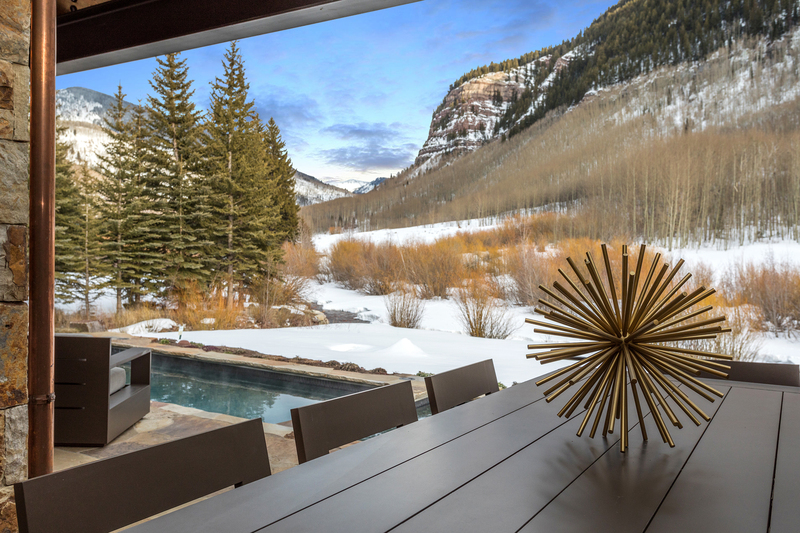 This 6 bedroom / 8 bathroom / 7,168 SF home is finished with a balance of natural materials of Telluride Gold stone, steel, copper and wood for beauty and longevity. 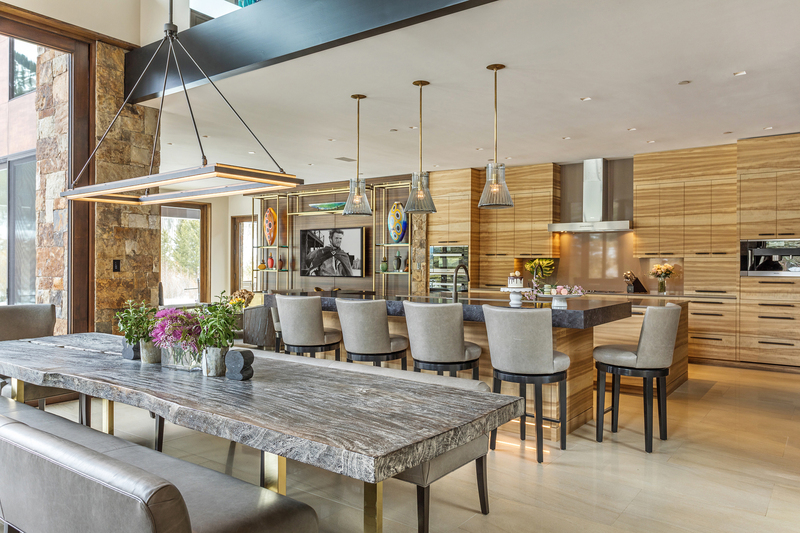 This home sets a new bar for luxury. 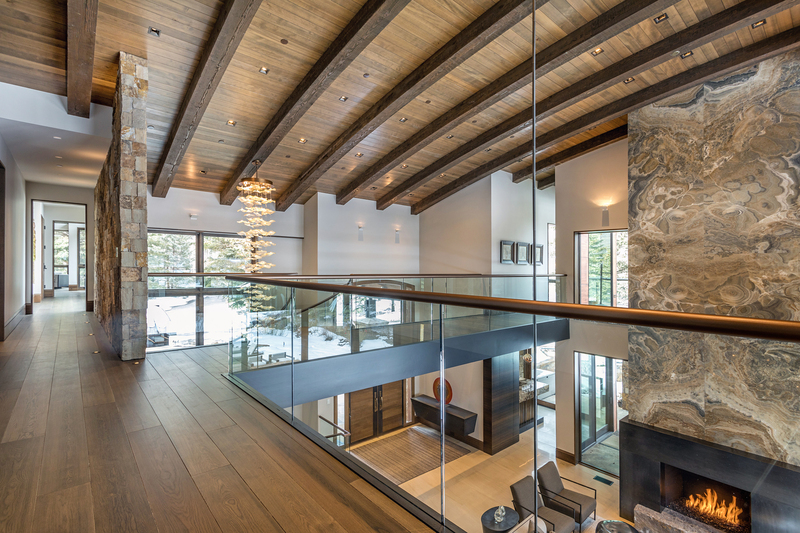 Welcoming you home, the foyer makes a statement by allowing guests to immediately enjoy the jaw-dropping mountain views without interference. 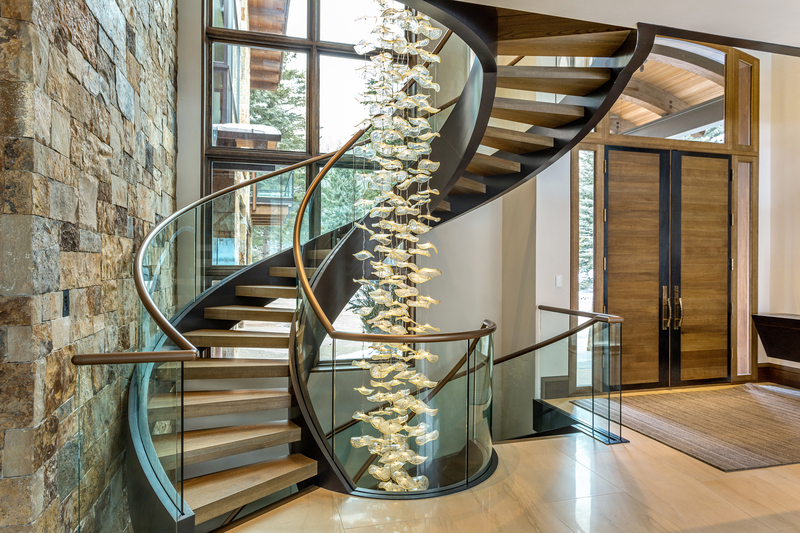 The spiral staircase’s atrium is adorned with a three-story hanging light sculpture that is viewed from every vantage point on the main floor of the home, especially in the evenings when illuminated. 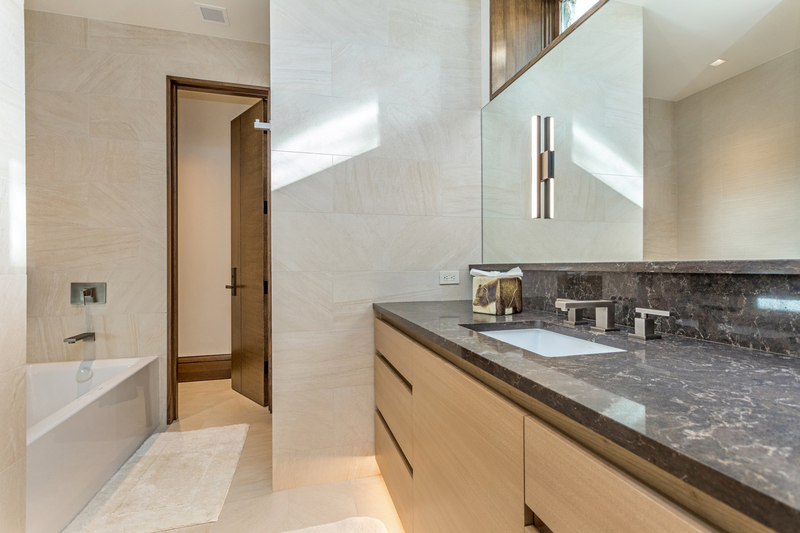 Enhanced with premium exotic marble in the living room, master bedroom, powder bathrooms & wet bar adds a level of opulence to the home. 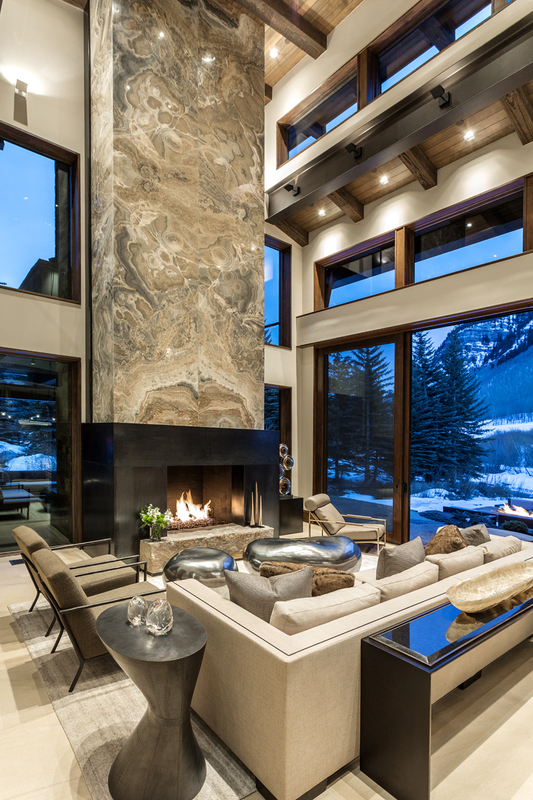 A graphic, dramatic and all around breathtaking Aria Stone fireplace adds a head-turning art form to an already stunning living room. 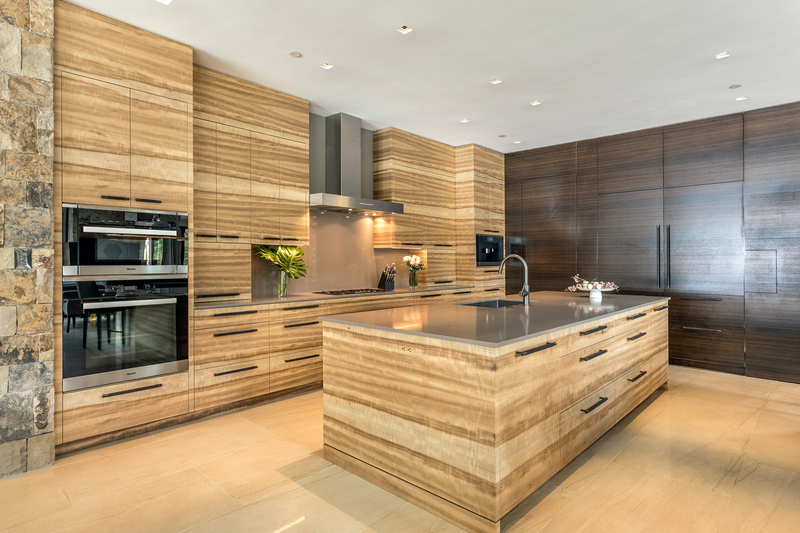 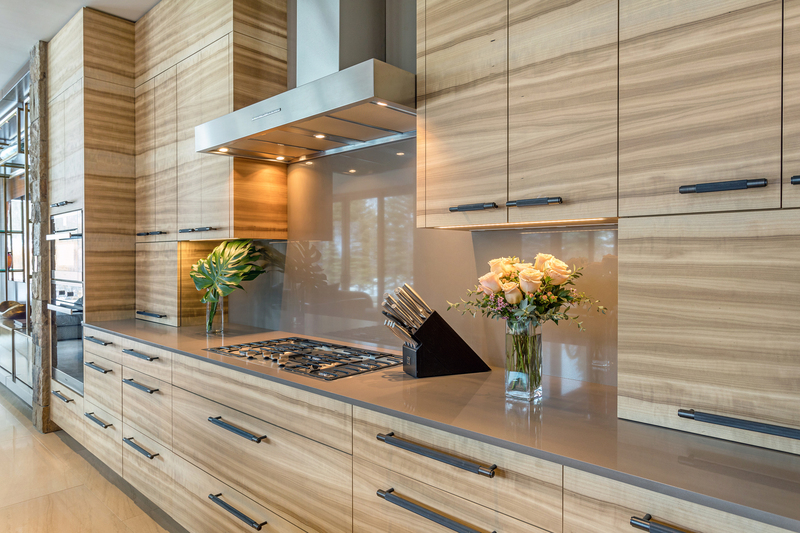 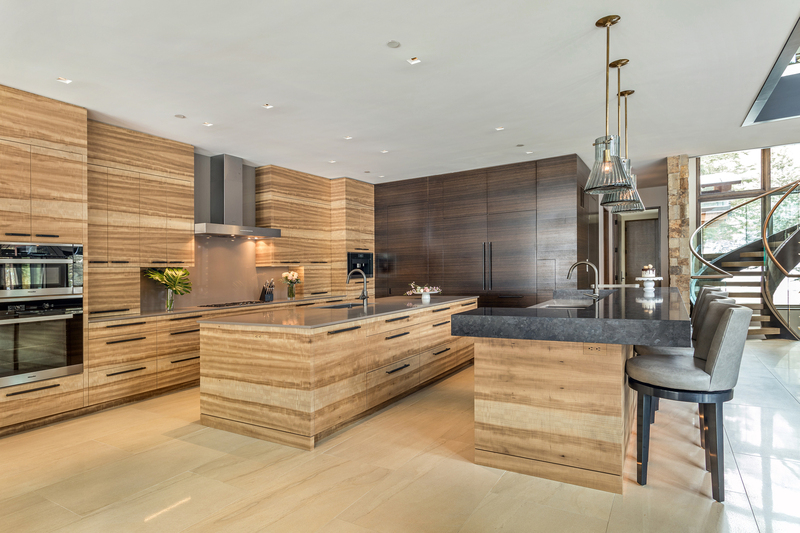 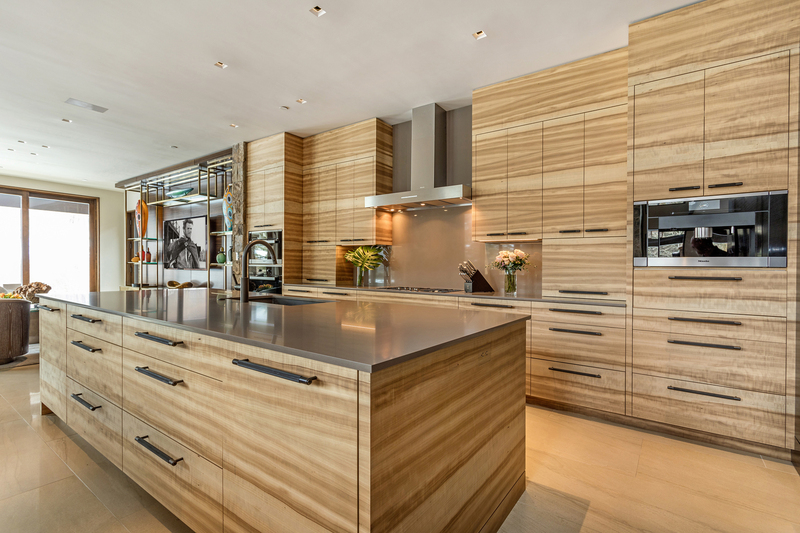 For a look that is current and sleek, the kitchen blends a smart mix of Flamed Aspen and Walnut woods for the cabinets, pantry and refrigerator / freezer panels. 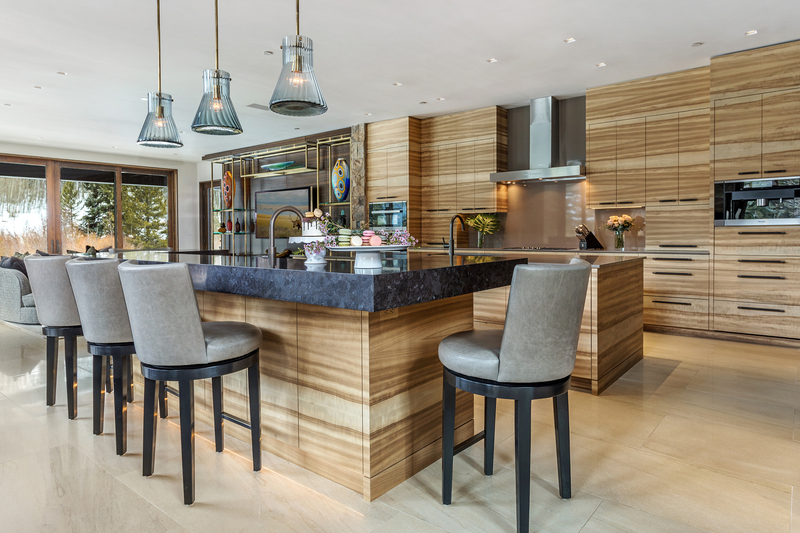 This highly functional chef’s kitchen was designed with cooking and entertaining in mind installing separate islands for the chef & sous chef to cook & prepare meals. 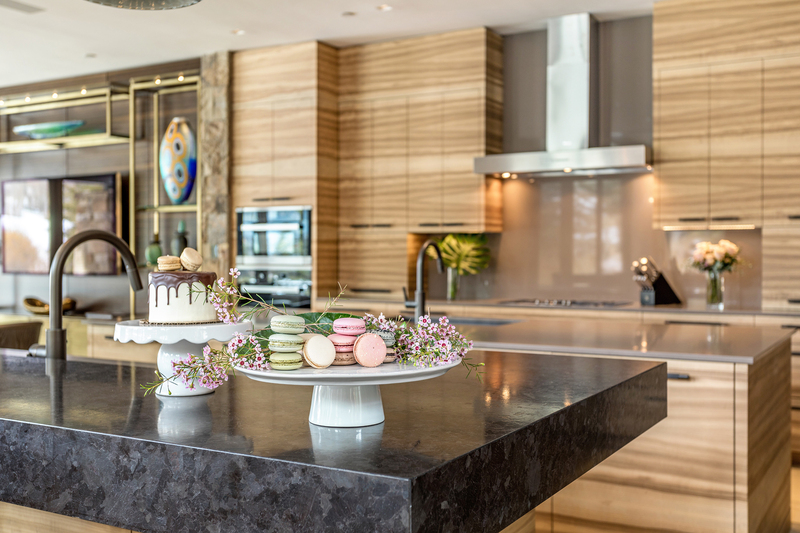 Professional quality, Miele appliances and Subzero refrigerator freezer drawers, two dishwashers, 2 additional temperature controlled drawers and a built-in Miele coffee system will ensure that even the most discriminating culinary aficionado will be duly satisfied. 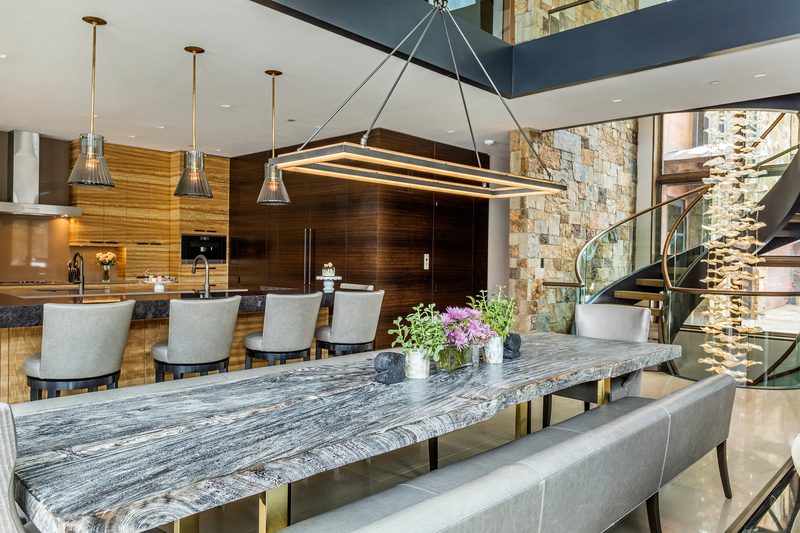 An oversized, modern live-edge wood slab dining table divides the large, open space between the living room and the kitchen bringing more of the outdoors inside while enabling large dinner parties. 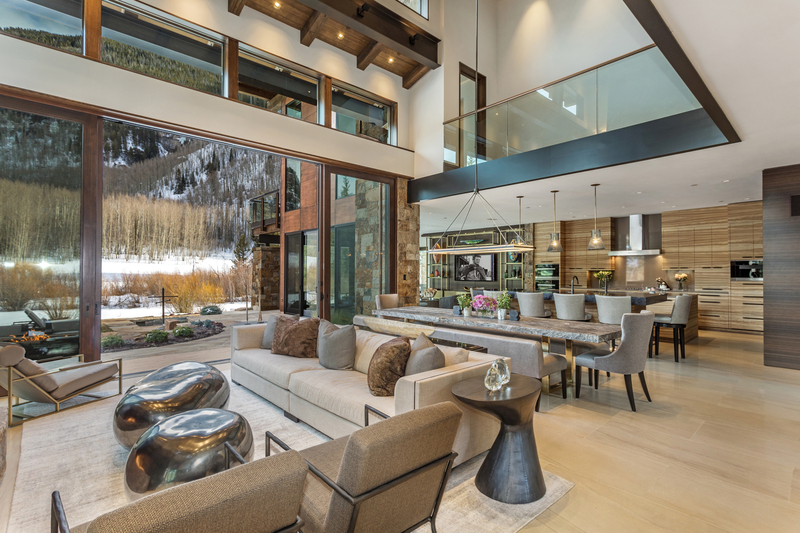 With multiple living spaces on the main floor, an additional den allows for a more casual sitting area with a mid-century modern, round-shaped sofa and extra-deep seating. 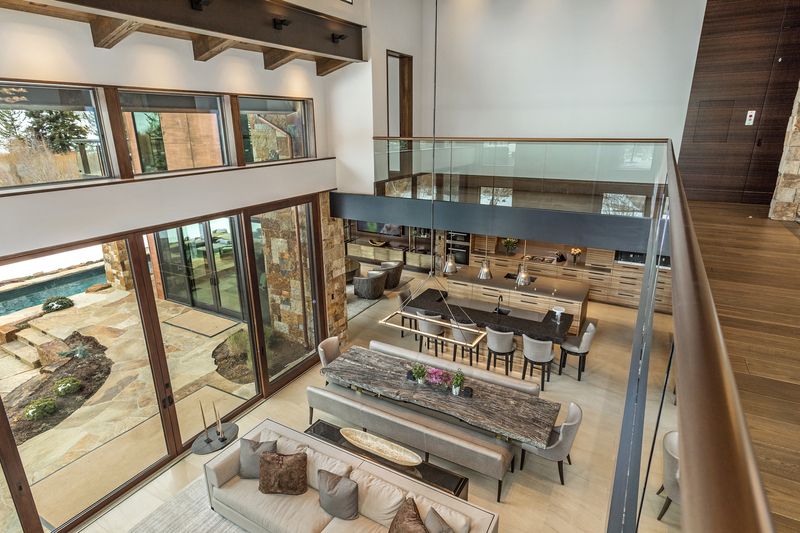 The main floor is filled with light and the floor to ceiling sliding glass doors wrapping around the home serve to take full advantage of the breathtaking views. 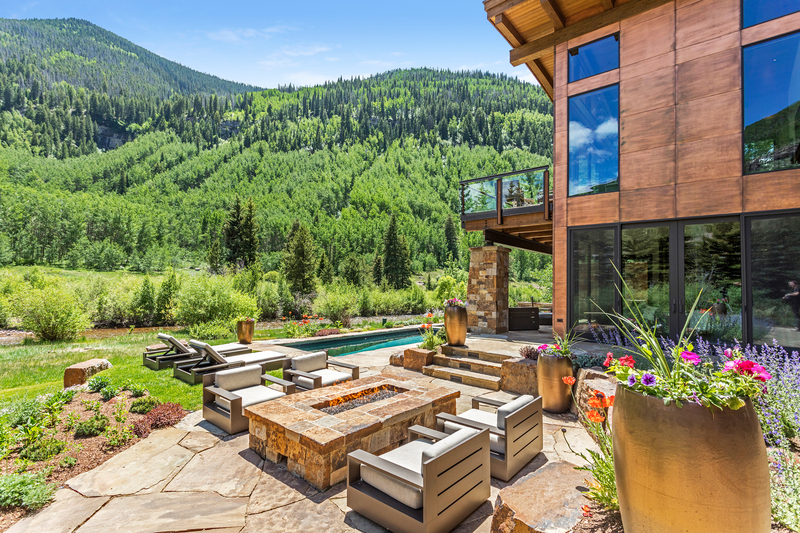 Once open, they give way to large, outdoor spaces ideally suited to entertaining or quiet reflection, while gently blurring the lines between indoor and outdoor living. 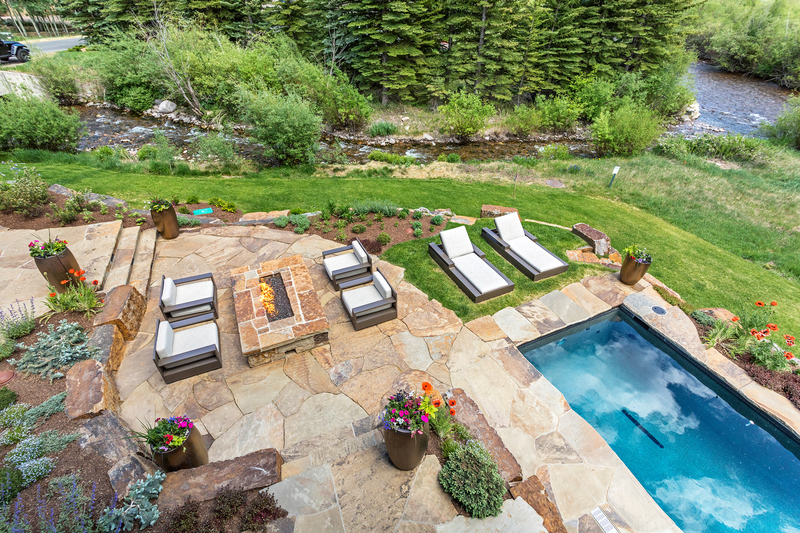 The home’s most unique characteristics are the back yard and its decks. 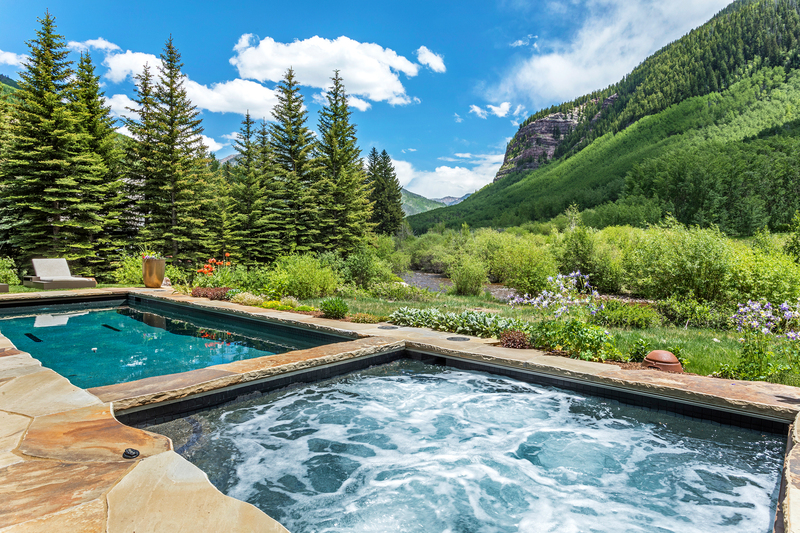 A full-sized custom gunnite, saltwater pool with an adjacent hot tub is easy to maintain throughout the year with help from the automatic covers. 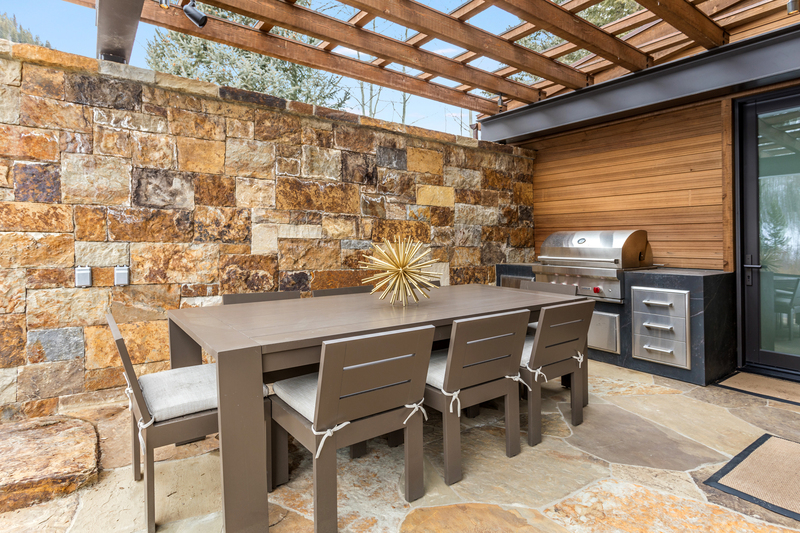 The outdoor living space also allows for multiple sitting & entertaining areas including a full-sized dining area & grilling station, a covered lounge area with fireplace and television, a fire pit and outdoor bathroom. 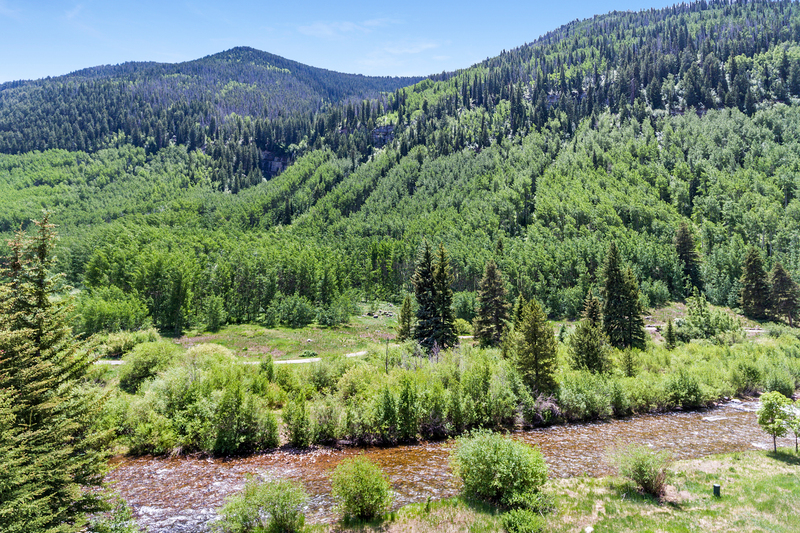 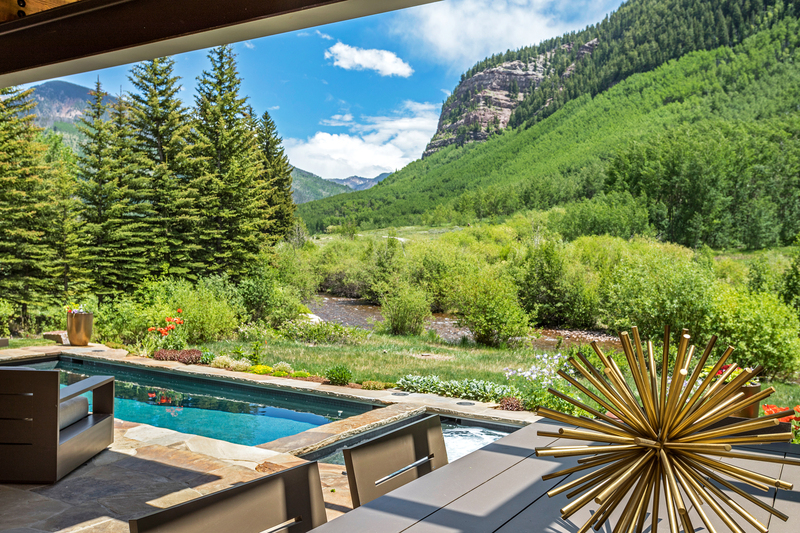 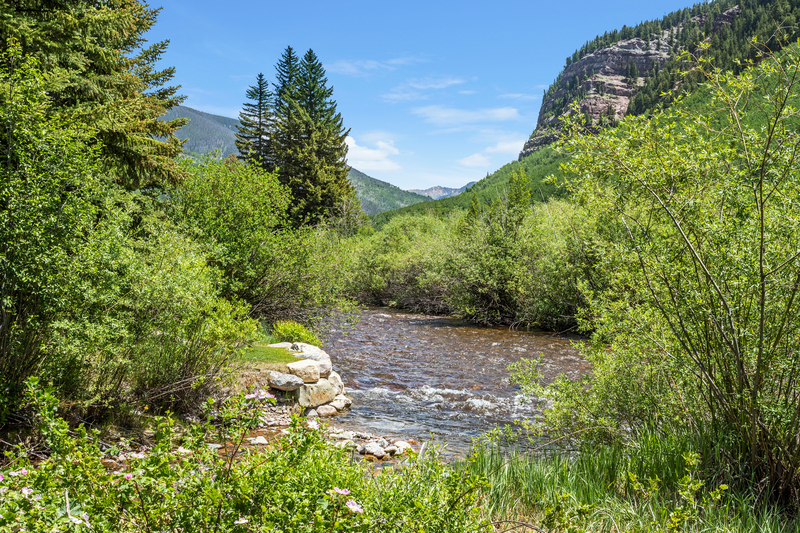 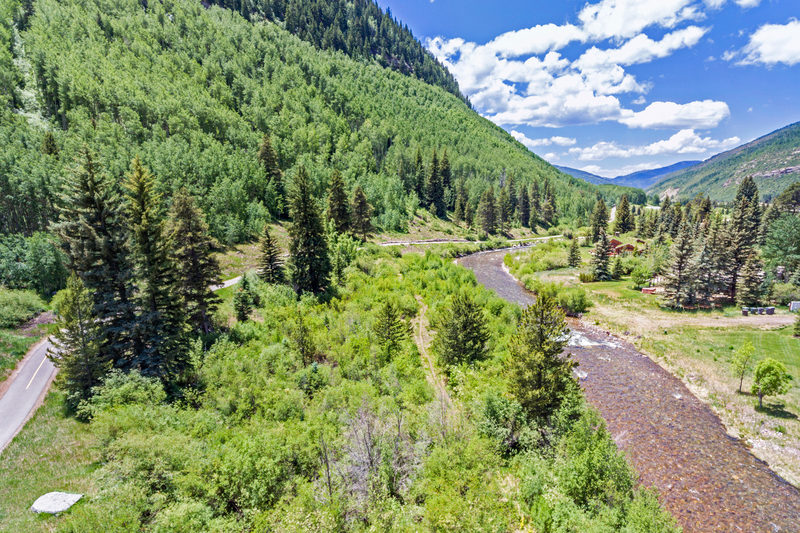 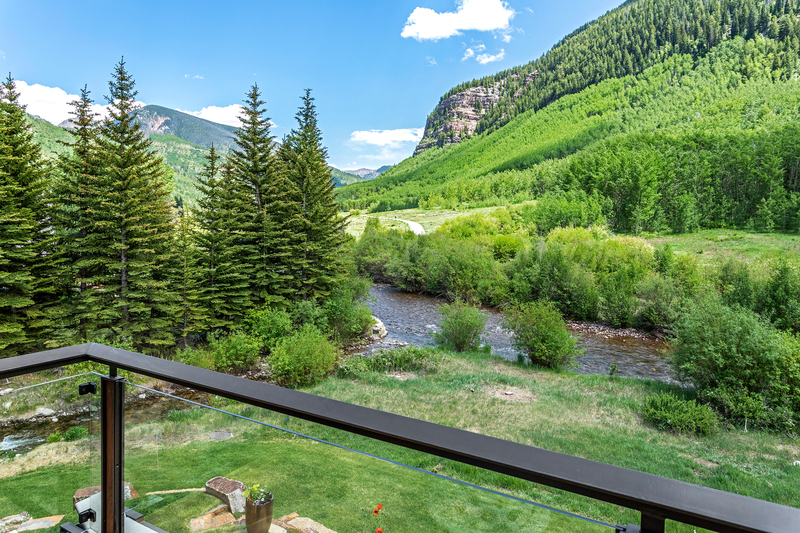 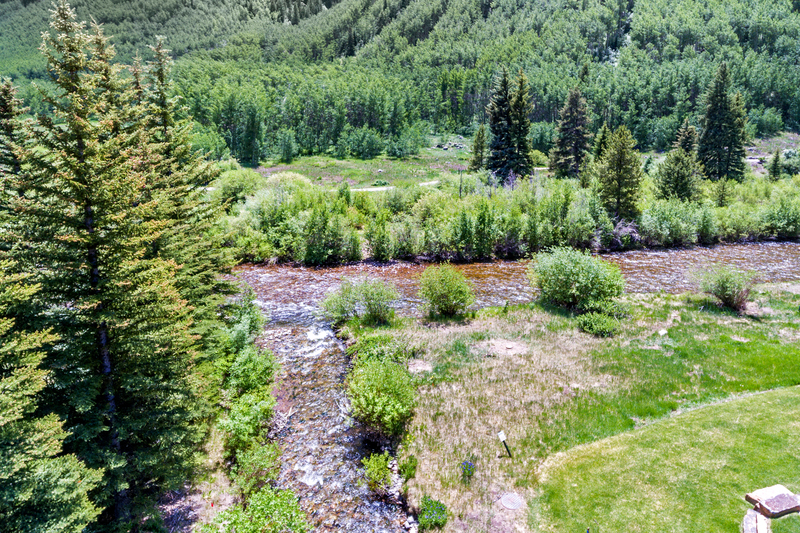 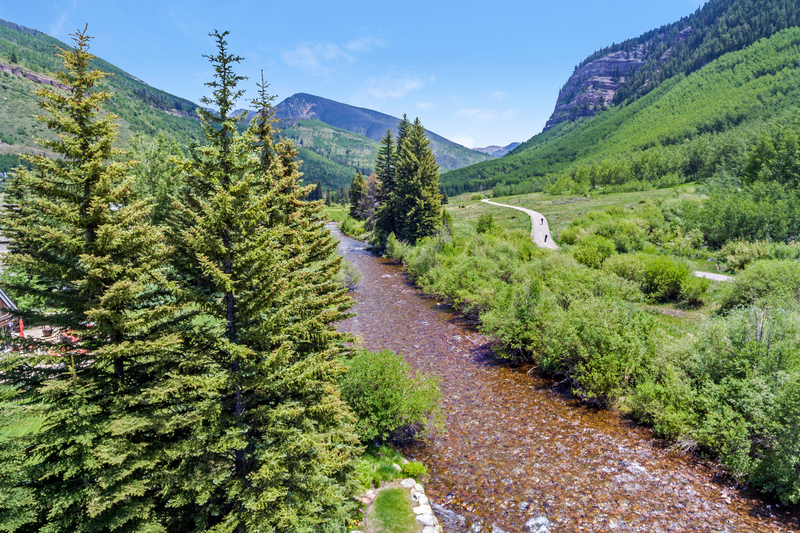 With a rare, large, flat yard situated along Gore Creek, all of these areas take advantage of the cross-valley views and are perfect for summer nights in the Rocky Mountains. 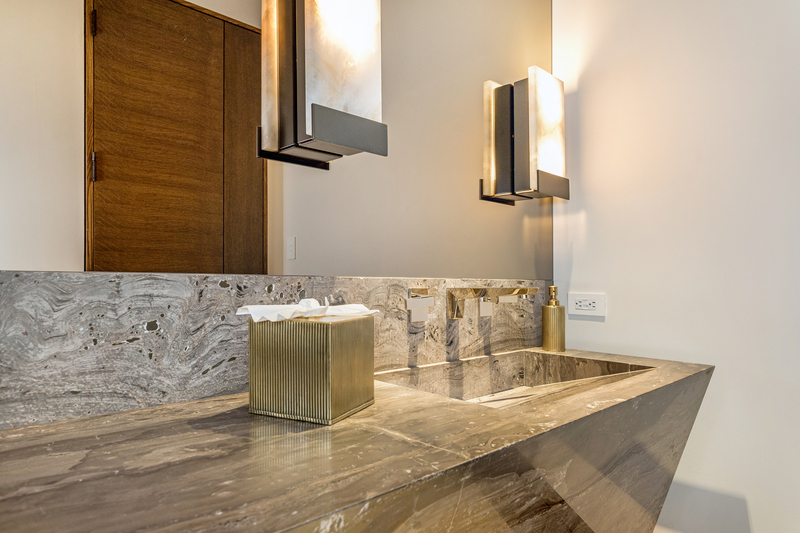 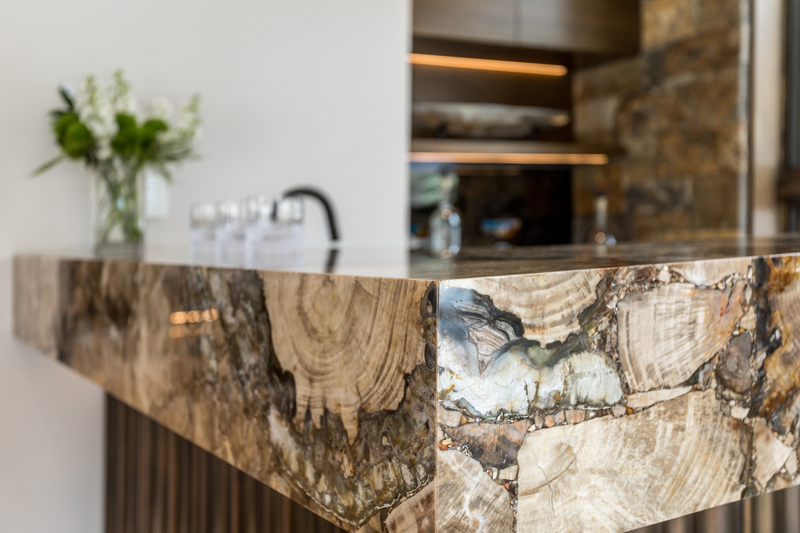 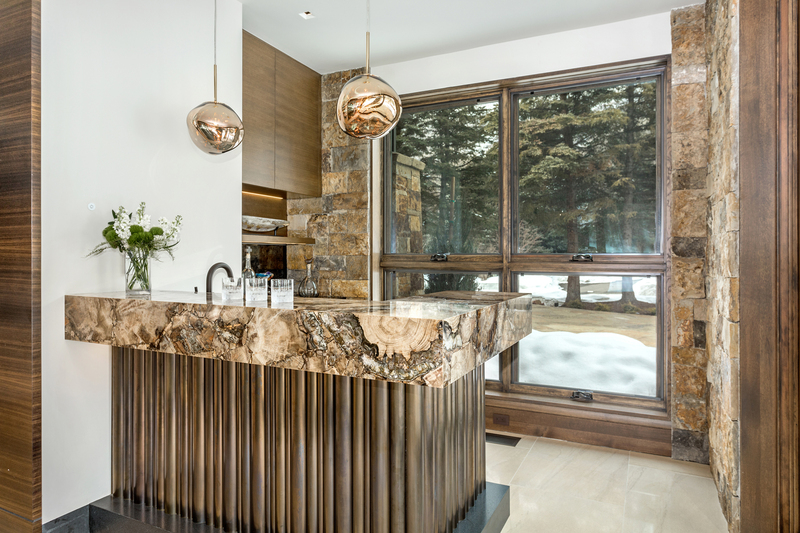 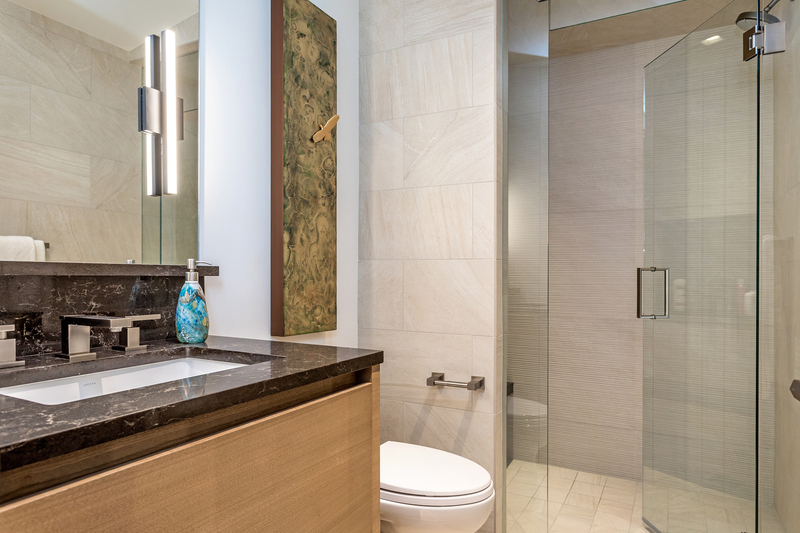 Circling back into the home and adjacent to the outdoor lounge area is a fully-equipped, elegant, wet bar with a polished petrified wood bar top sure to impress your guests. 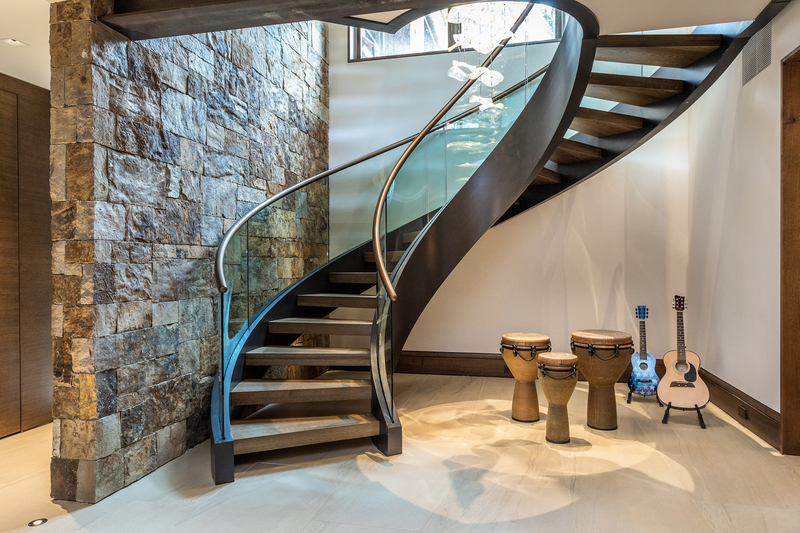 Winding upstairs, the upper level creates an atrium providing space and light which provides a visual link to the natural surroundings. 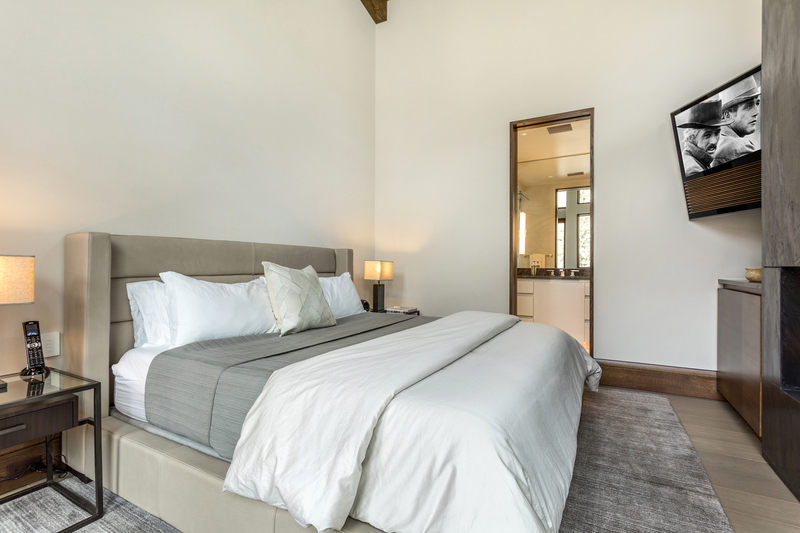 Accessible by elevator, the master suite is in its own wing of the home. 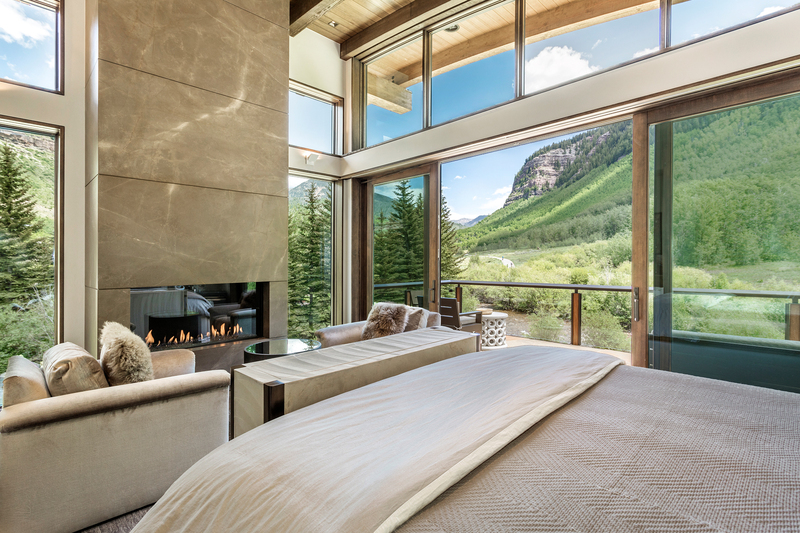 The soaring curved roof bring the outdoors into the master bedroom and captures the beauty of the surrounding mountains. 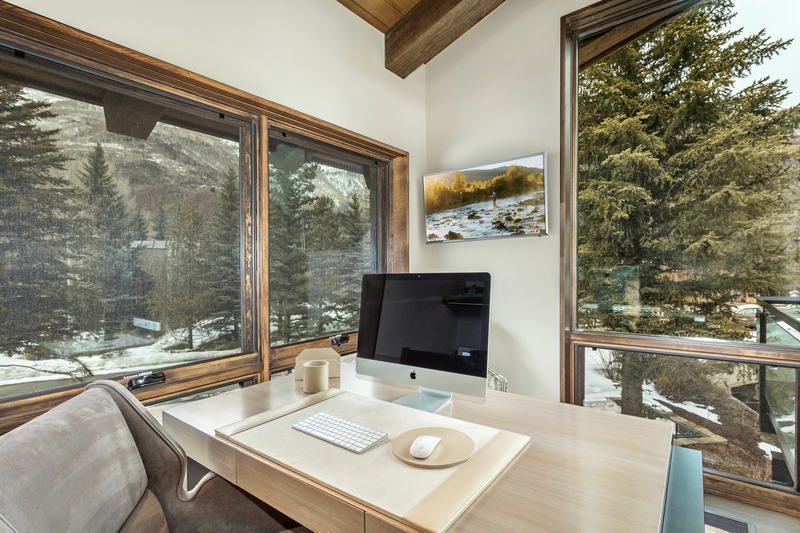 Sliding glass doors allow you to seamlessly absorb the views of the Gore Range and Vail Mountain, yet when it’s cold you can warm up to the fireplace in the suite. 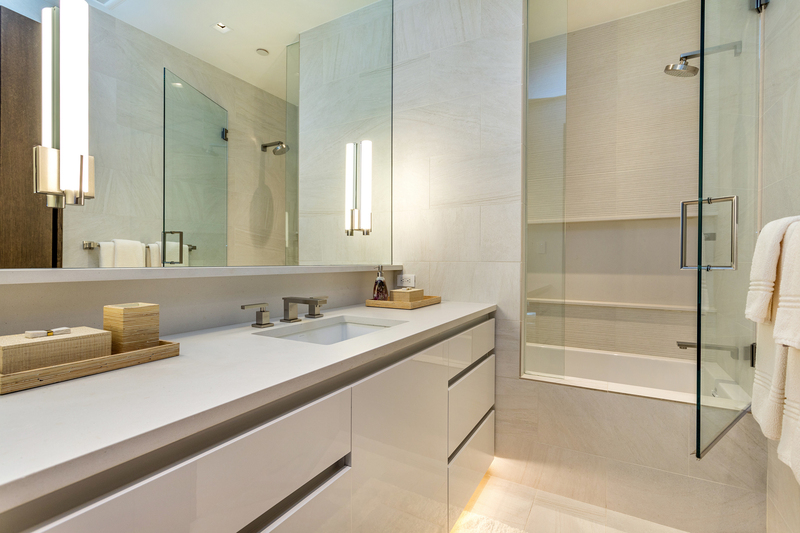 The bathroom is guaranteed to be a showstopper. 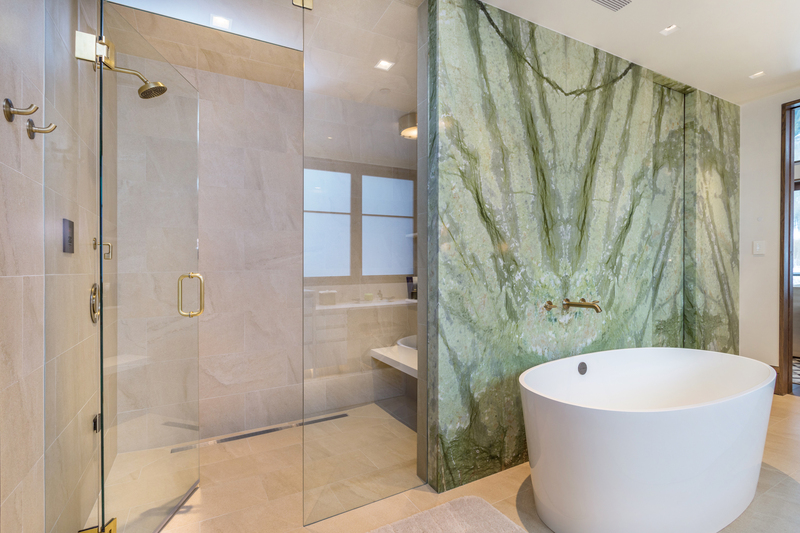 An electric green marble slab from the Orient adorns the full length of the wall and reflects back in the wall-to-wall mirror. 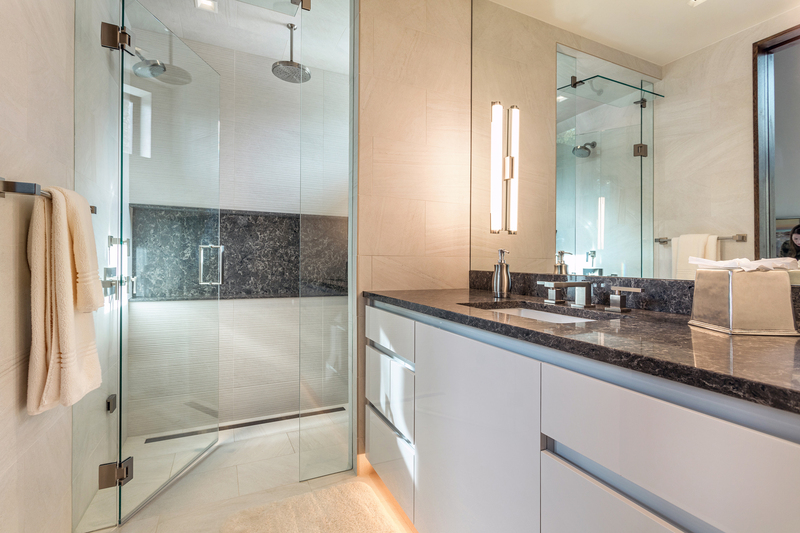 Walk beyond these waves in shades of green, which make you feel like you are in a tropical paradise, into the walk-in closet with an automatic sliding door for privacy. 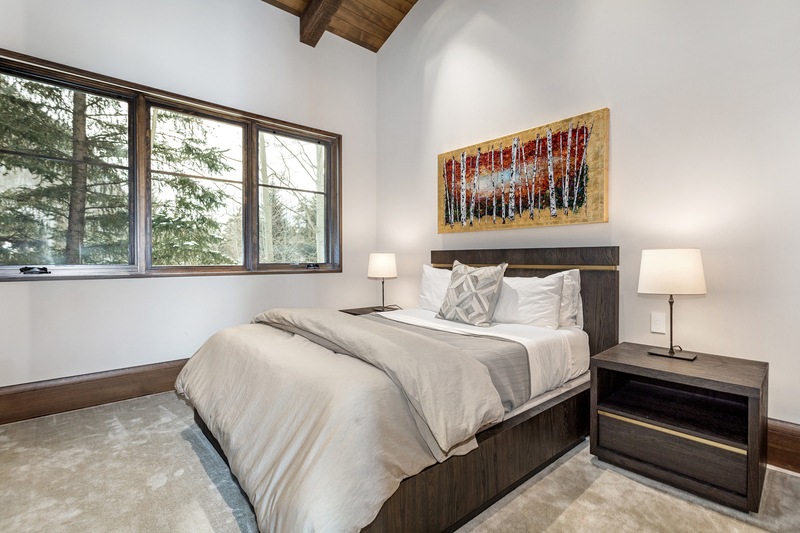 Hans Burglund’s design uses warm wood, clean lines, symmetry and contemporary color to create welcoming, comfortable and cozy bedrooms. 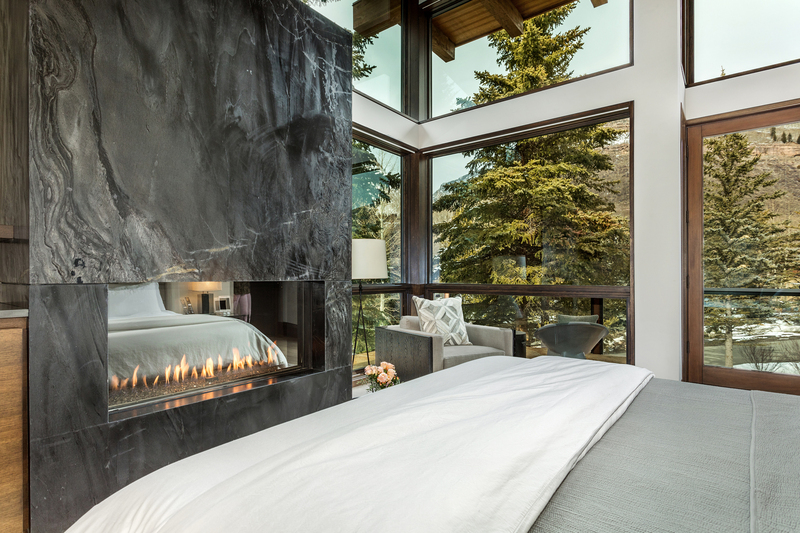 Rounding out the top floor are 2 en-suite bedrooms and a guest master suite with its own fireplace and walk out patio. 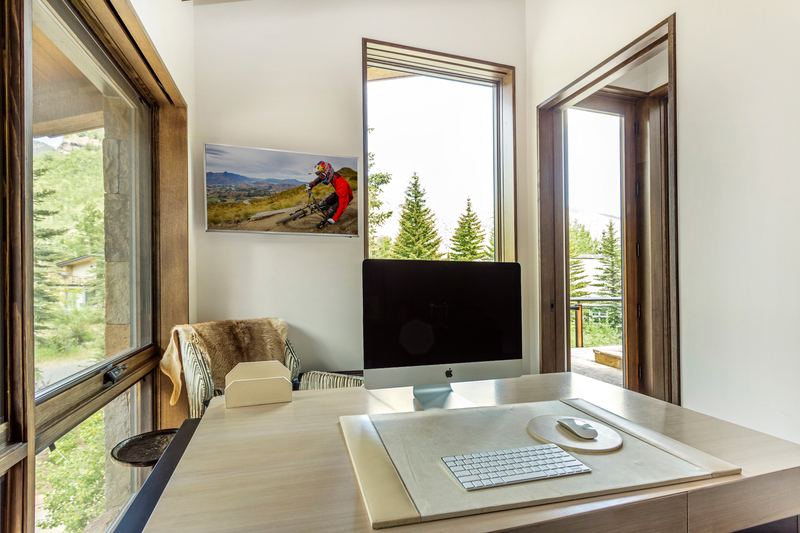 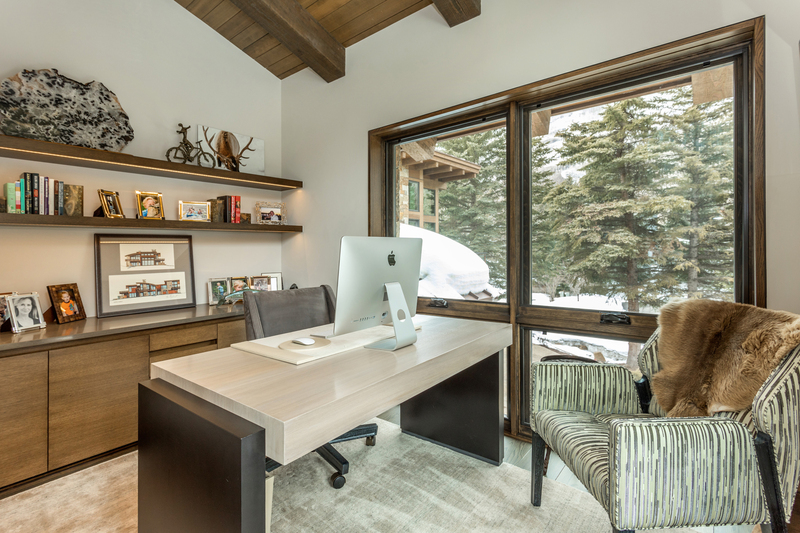 An office allows you to work from home in privacy and for elevated mountain views there is a cantilevered deck with an additional hot tub and fireplace. 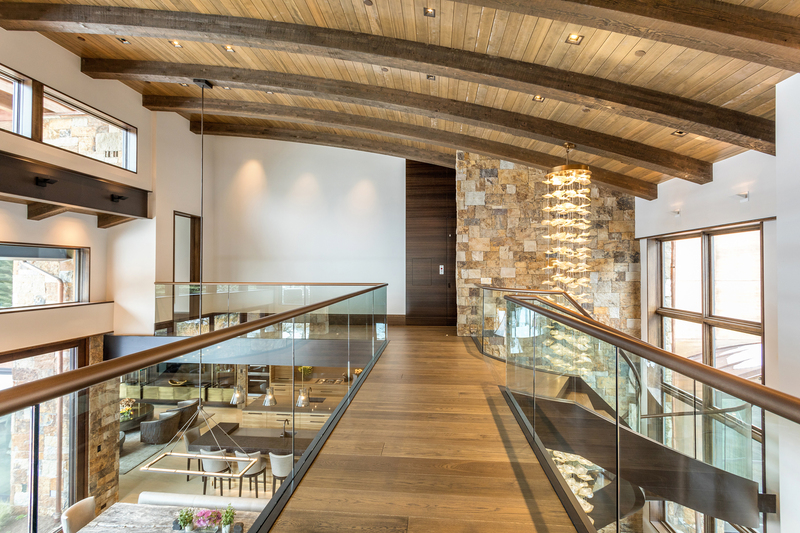 On the lower level is a modern, luxury media room with a dropdown projection television system which is great for relaxing après, watching a game and entertaining. 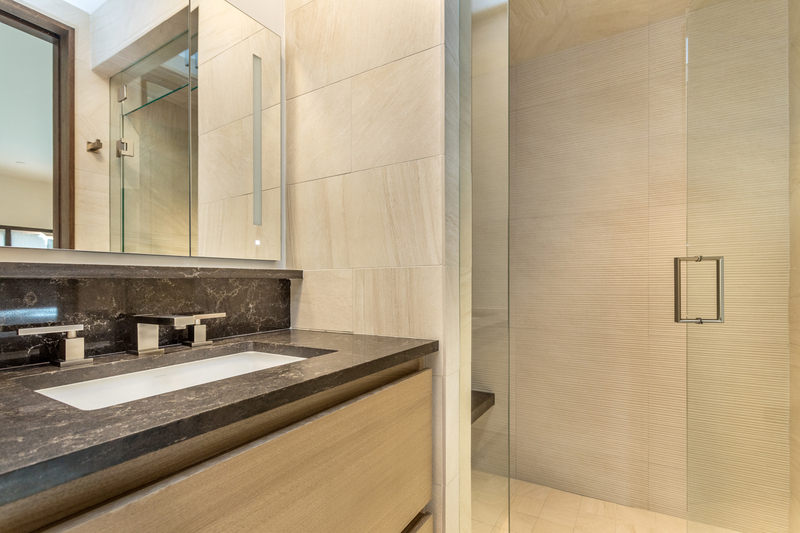 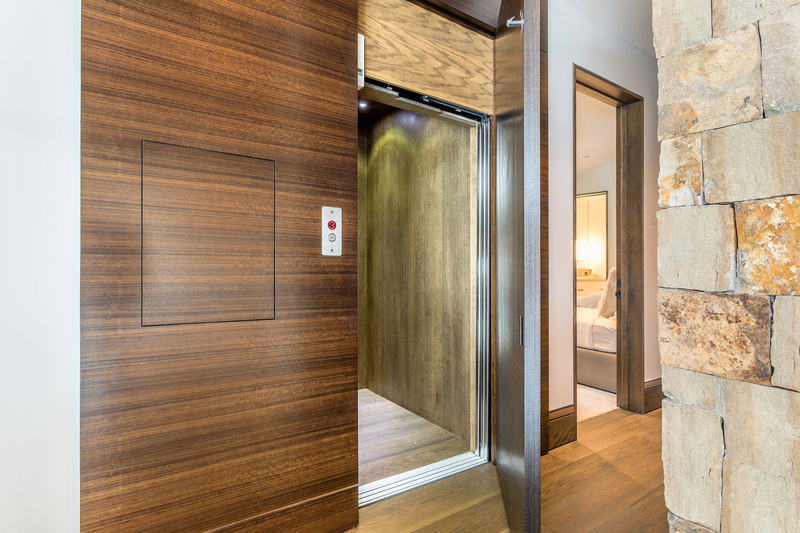 Also, accessible by elevator are two more en-suite bedrooms, a powder room and laundry room. 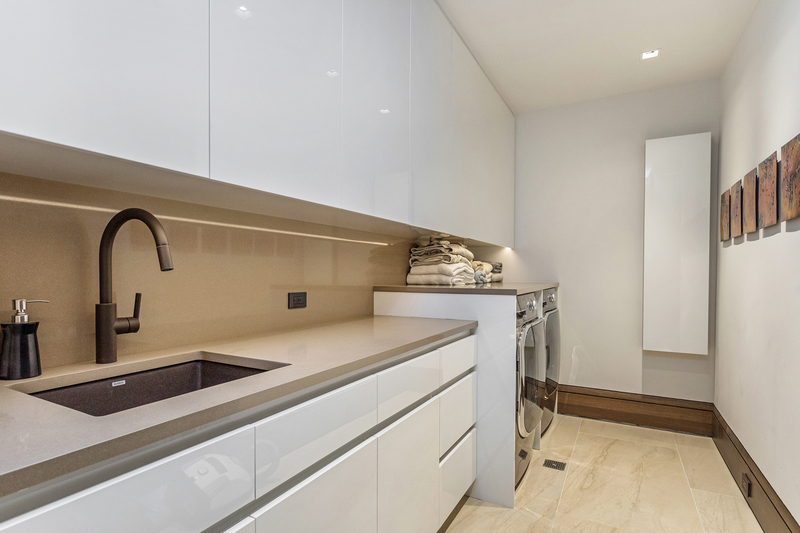 An oversized three-car garage with shelving system allows for plenty of bike & gear storage, as well as a dog washing station. 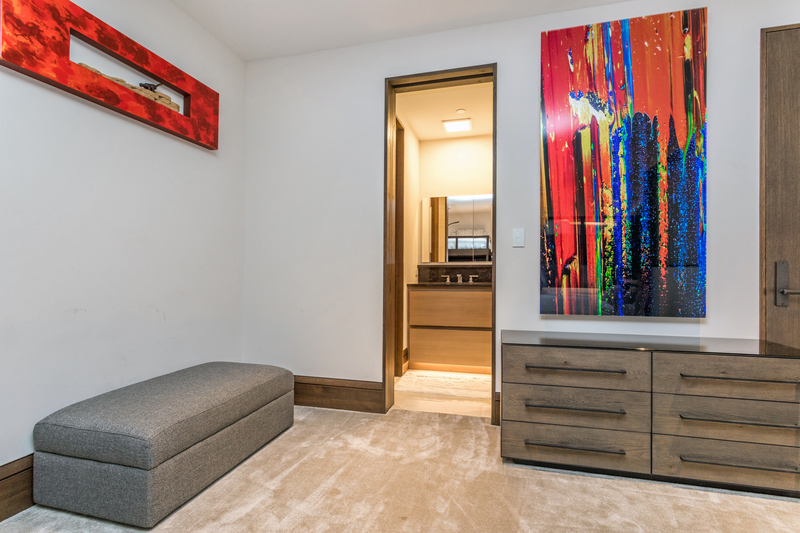 The custom mudroom area has cubbies for meticulous organization, an additional coat closet and a Chinook Boot Dryer equipped for 12 pairs of boots. 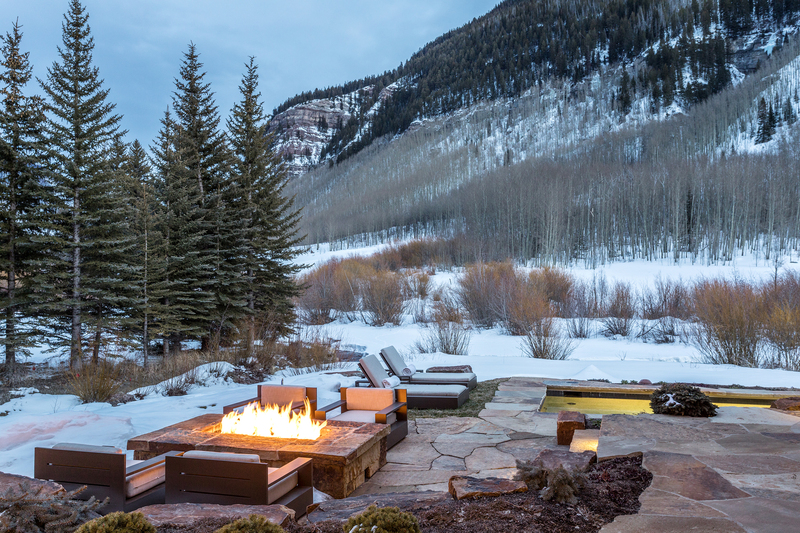 A heated snow melt system on the outdoor decks and motor court ensures your winter months are stress free. 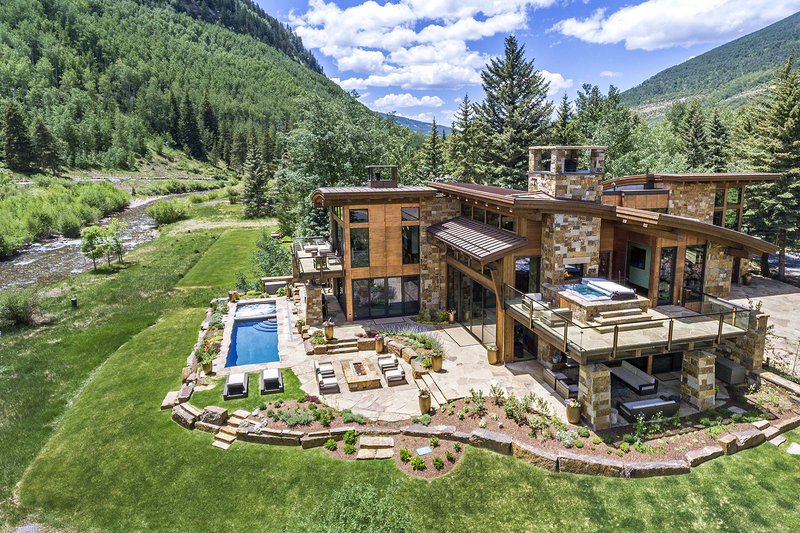 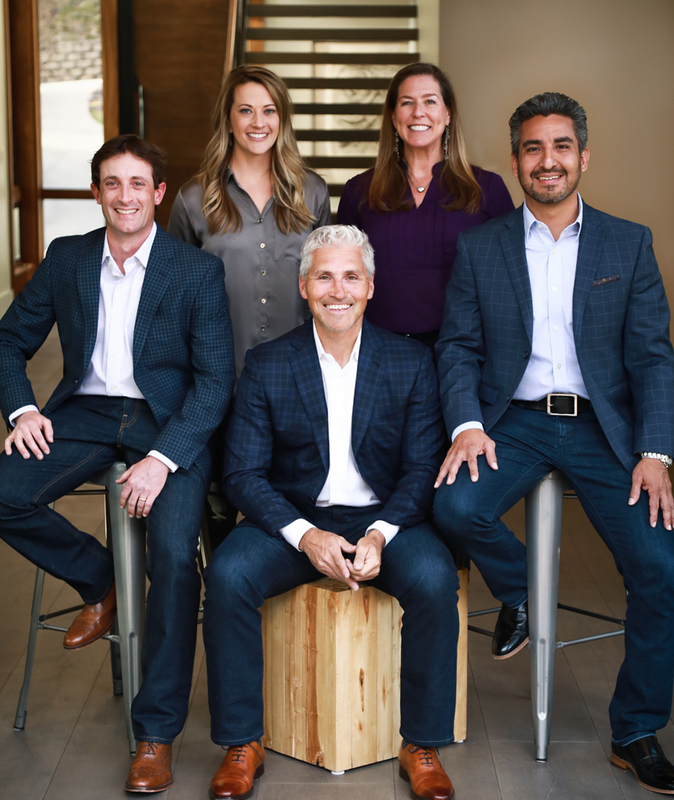 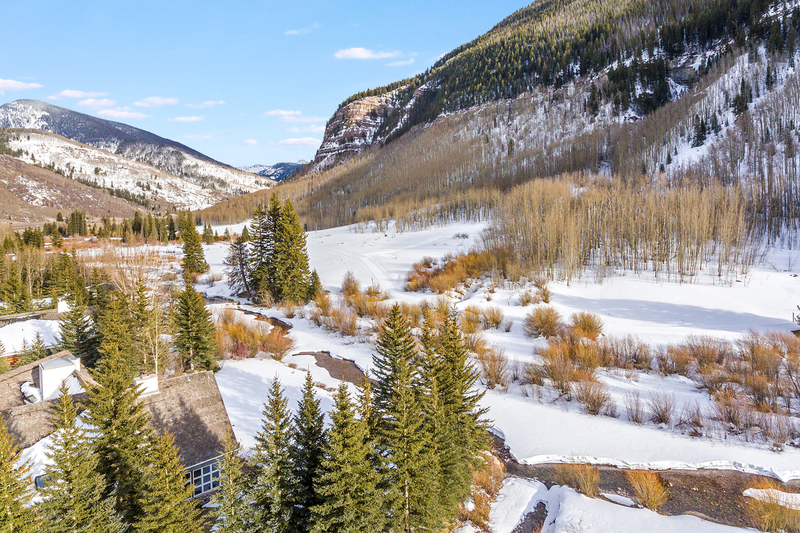 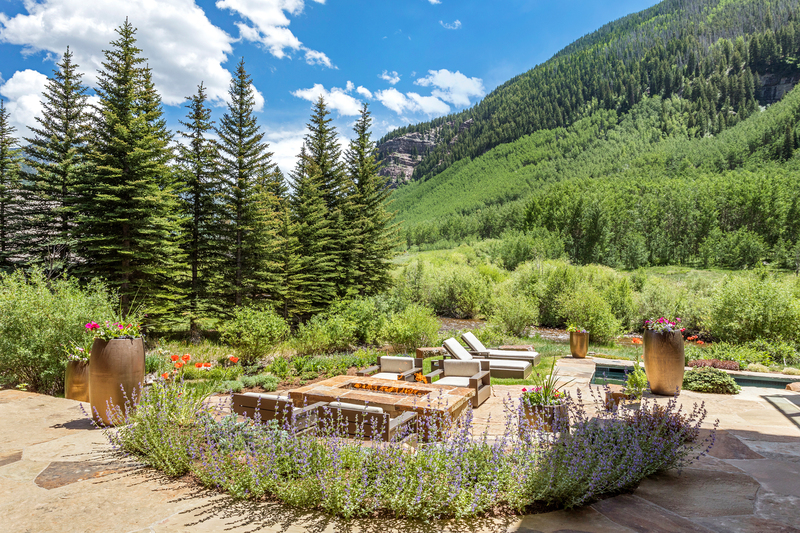 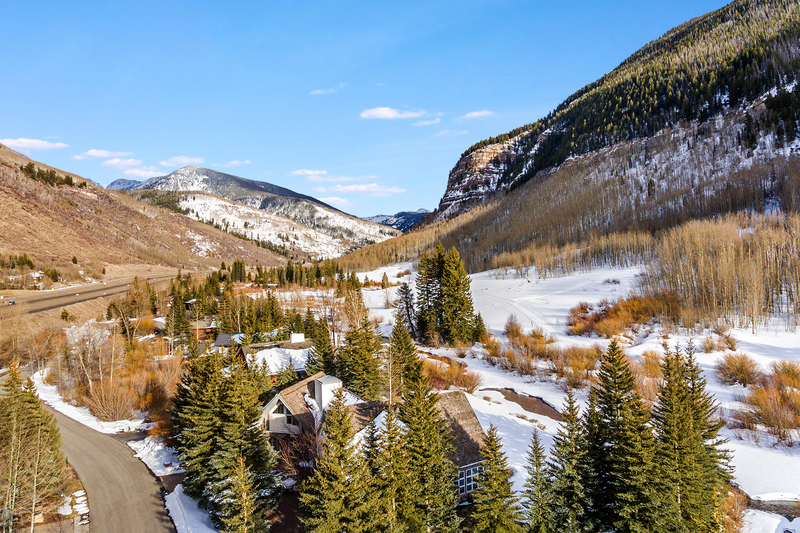 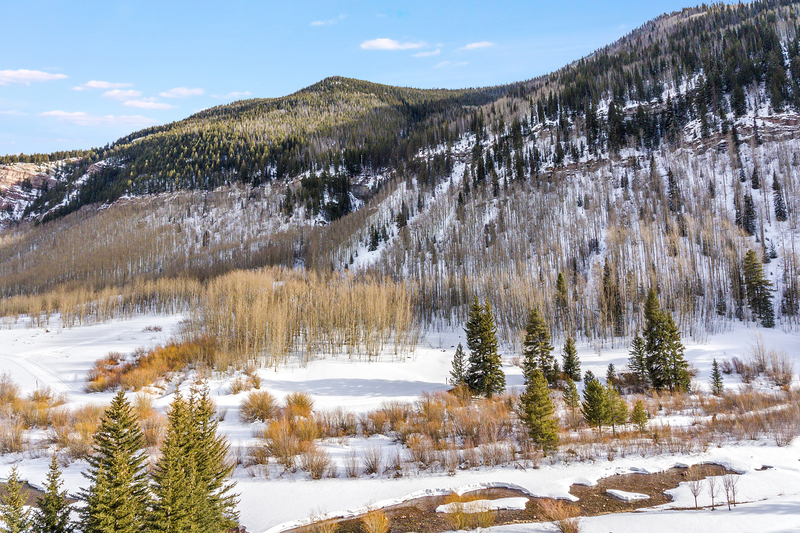 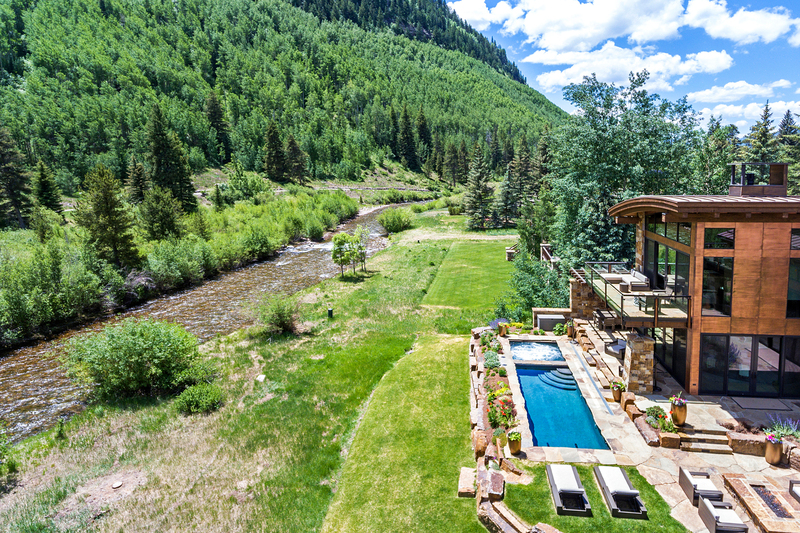 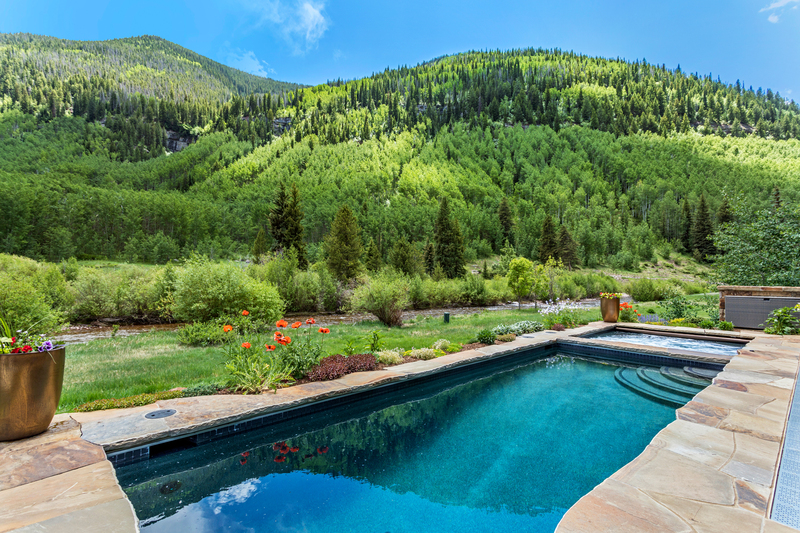 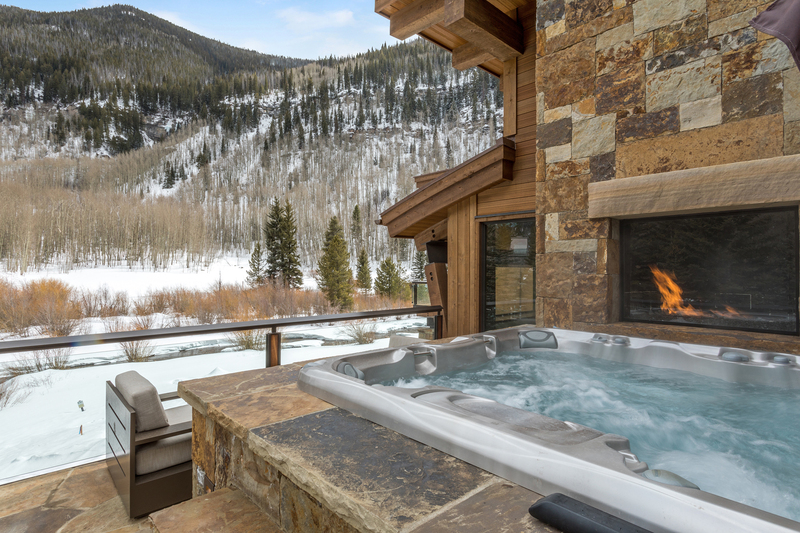 Uncompromising in its commitment to quality throughout this property offers the perfect balance between privacy and proximity to all of the amenities in the Town of Vail.